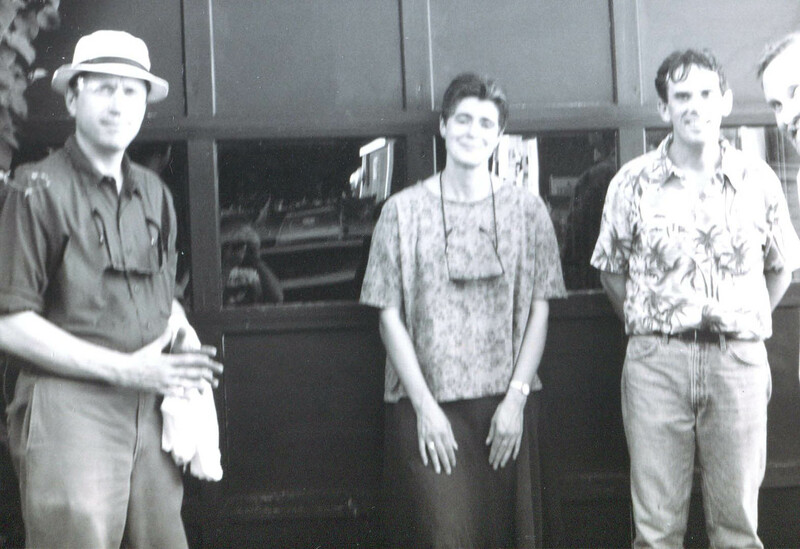 The Howling Turbines on a blistering hot day at the Free Street Taverna, Aug. 1, 1999: from left, drummer Ken Reynolds, bassist Gretchen Schaefer and me — guitarist and singer Doug Hubley. I was wearing the tan sport jacket because we had just seen “Jazz on a Summer’s Day” and I thought that tie, jacket and sweat was a great look. Photo by Jeff Stanton. Oh no! He’s going to talk about his career again! Skip all that and go directly to the throbbing rock sounds at the Nimbit and Bandcamp stores! 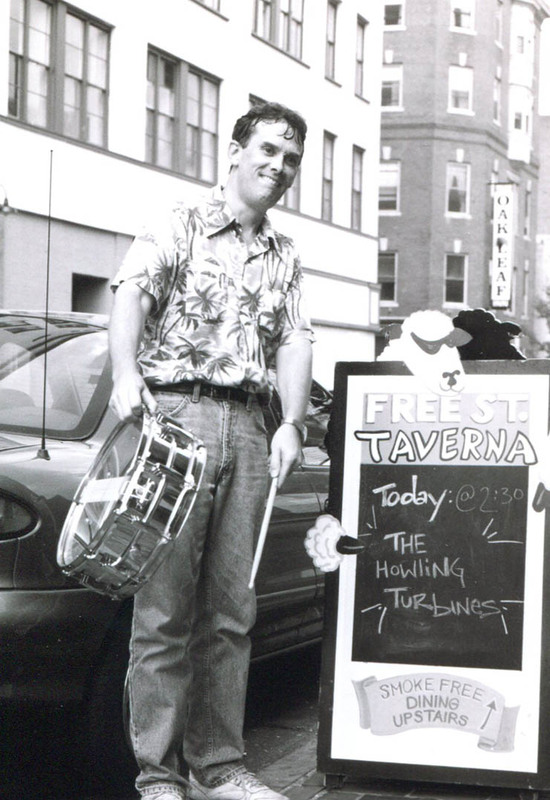 The best years of our band the Howling Turbines also happened to be my final years (to this point, anyway) as a freelance writer and editor. 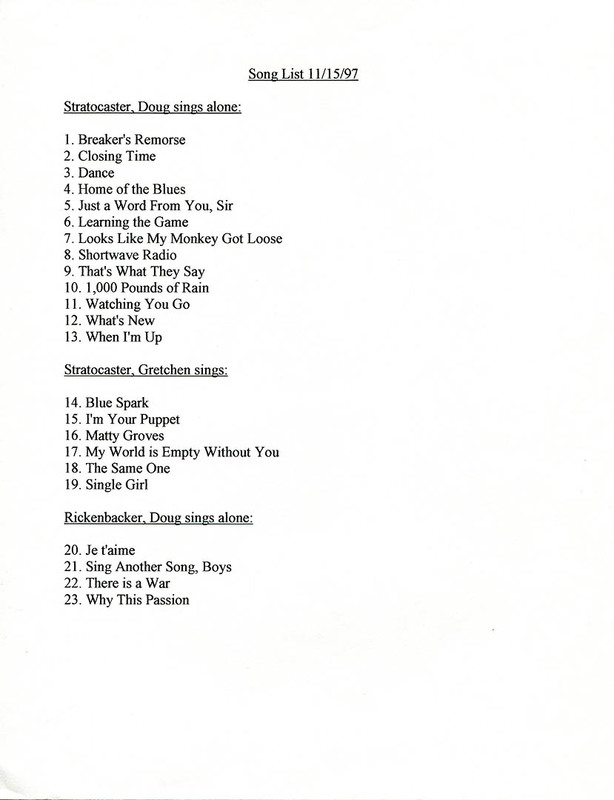 The Turbines’ repertoire in July 2001. The annotations indicate things I needed to work on. 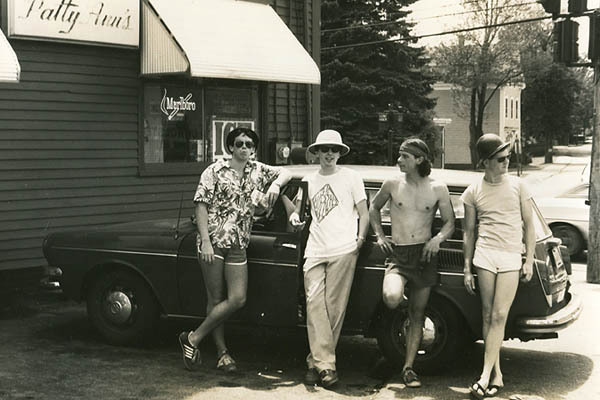 Hubley Archives. As previously noted, the Turbines came together in February 1997, as drummer Ken Reynolds rejoined bassist Gretchen Schaefer and me after a separation of more than five years. Long-necked woman with a black skirt: Howling Turbines bassist Gretchen Schaefer at the Free Street Taverna, Aug. 1, 1999. Photo by Jeff Stanton. 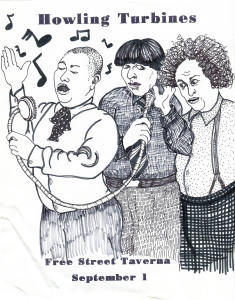 During those four-plus years the Turbines had the most energy, learned the most and best songs of our career, and gave the most public performances — albeit nearly all of them at the Free Street Taverna. A surge of creativity can have many causes, and novelty is a potent one, but it’s safe to say that novelty was not the primary source of our energy during those years. In fact, familiarity and comfort may have had more to do with it. Gretchen and I had solidified our bass-and-guitar relationship during the previous band, the Boarders. 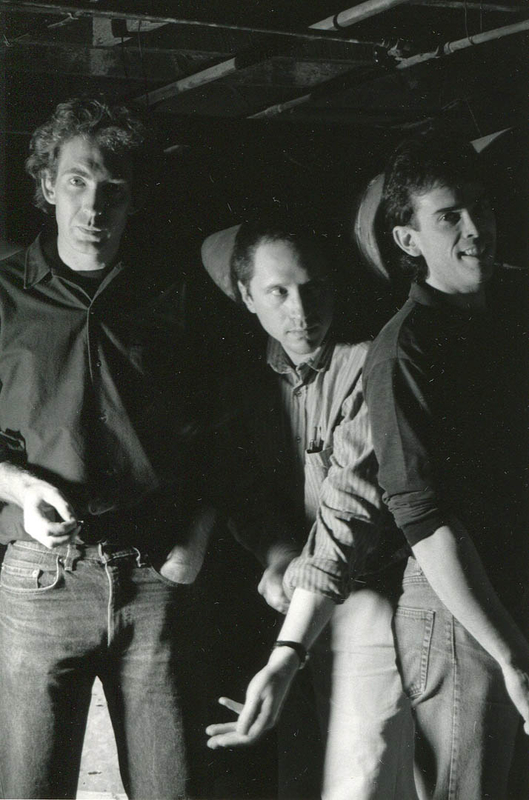 Ken and I had a musical history dating back to the late 1970s, and the three of us had played together in the early Cowlix. 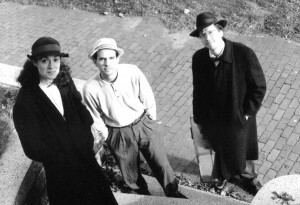 Gretchen played rhythm guitar then, so it’s likely that most of the discovery in the Turbines’ evolving musical chemistry took place in Gretchen and Ken’s development as a rhythm section. 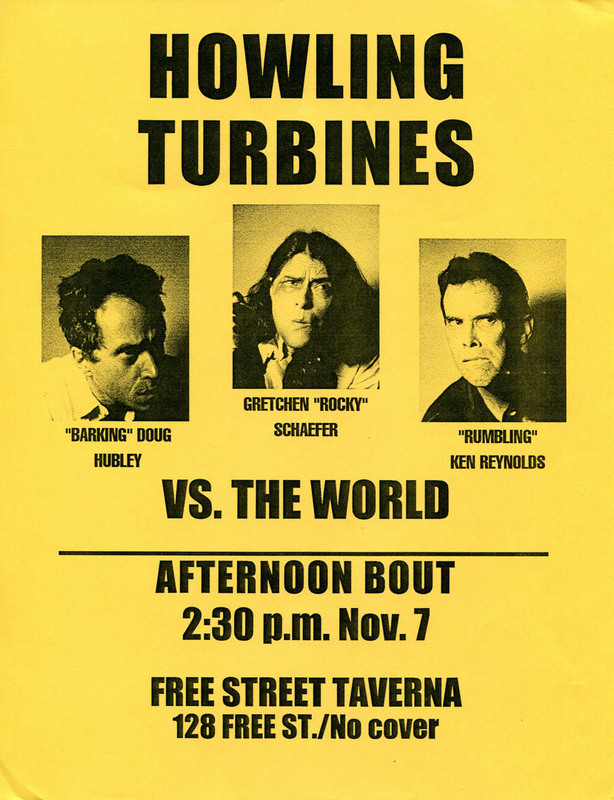 An entry in Gretchen Schaefer’s series of Howling Turbines posters based on Three Stooges publicity stills. Hubley Archives. One of the things that made the Turbines such hot stuff early on, I believe, was an appetite for new-to-us material coupled with the confidence that we could do something good with it. Comfortable with each other personally and musically, we just had a lot of songs we wanted to try. And if the stylistic promiscuity that I’ve written about so often had risen to a new height with the Boarders, it hit the stratosphere with the return of Ken Reynolds. In those growth years of the Howling Turbines, Ken was like Santa Claus when it came to bringing in songs. I’m a lifelong Byrds fan and have the Rickenbacker to prove it, but it was Ken who proposed that we do “World Turns All Around Her,” “Have You Seen Her Face,” “Why,” “One Hundred Years From Now” and “Thoughts and Words” — one of the Turbines’ best numbers. Bang a drum slowly and hold the stick lowly. 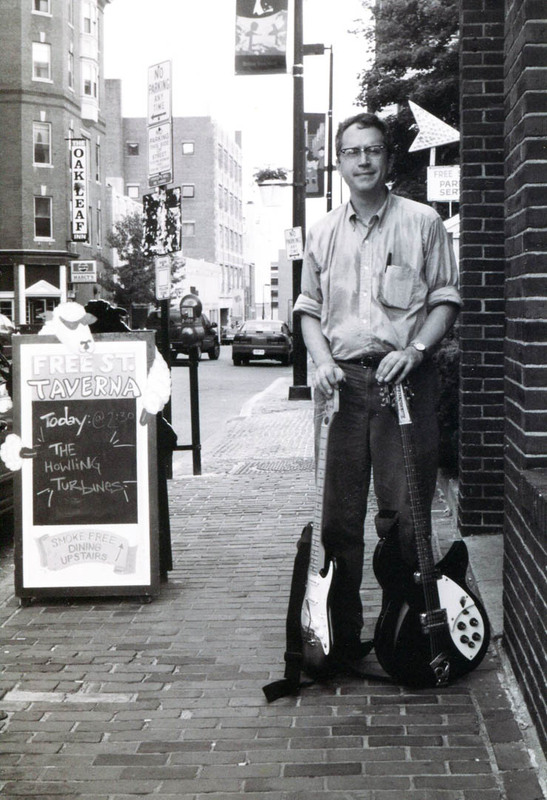 Ken Reynolds at the Taverna, Aug. 1, 1999. Photo by Jeff Stanton. Some of Ken’s picks quickly became signature Turbines numbers. “Thoughts and Words” was one; others were Johnny Cash’s “Home of the Blues,” rendered as country-metal, and Buddy Holly’s “That’s What They Say,” propelled by Ken’s trademark rumble on the tom-toms. 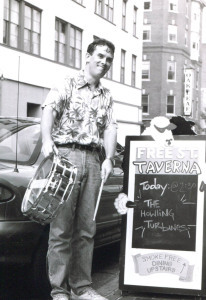 DH and the boys outside the Taverna during a Howling Turbines gig on Aug. 1, 1999. Photo by Jeff Stanton. Not that Gretchen and I were twiddling our thumbs in the parking lot while Ken was doing all the repertoire shopping. Gretchen brought in another of our most durable songs, the Carter Family’s “Single Girl, Married Girl,” on which she sang lead. In a nod to Gram Parsons’ exemplary soul-country crossovers, we sang through-harmony on James and Bobby Purify’s “I’m Your Puppet.” (We bought the single at Bill O’Neil’s House of Rock and Roll on a February day.) The three of us turned the Yardbirds’ “Heart Full of Soul” into a dramatic metallic dirge featuring Gretchen’s excellent supporting vocal and bass signature riff adapted from Jeff Beck. 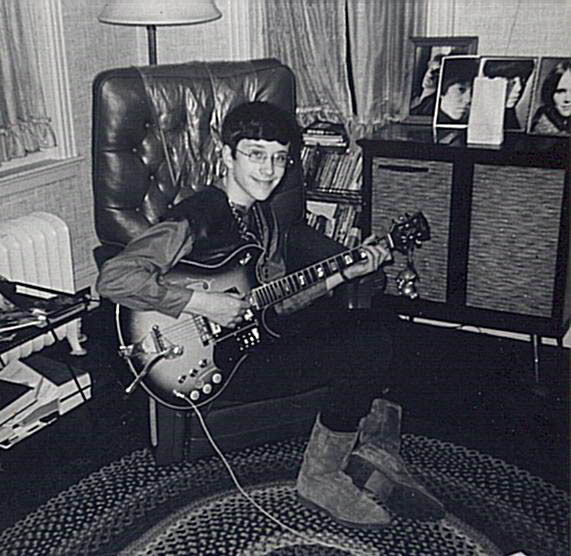 And among my first contributions to the Turbines Hit Parade was a song I had been hankering to do for 20 years, Gene Clark’s “The Same One.” I vividly remember how great it felt as we were learning it and the pieces were falling into place, the whole suddenly transcending the sum of the parts. That’s what I’m in it for. That day job that I lost in March 1997, by the way, was an case of crossing the fence to get at the greener grass, only to find that it’s Astroturf. 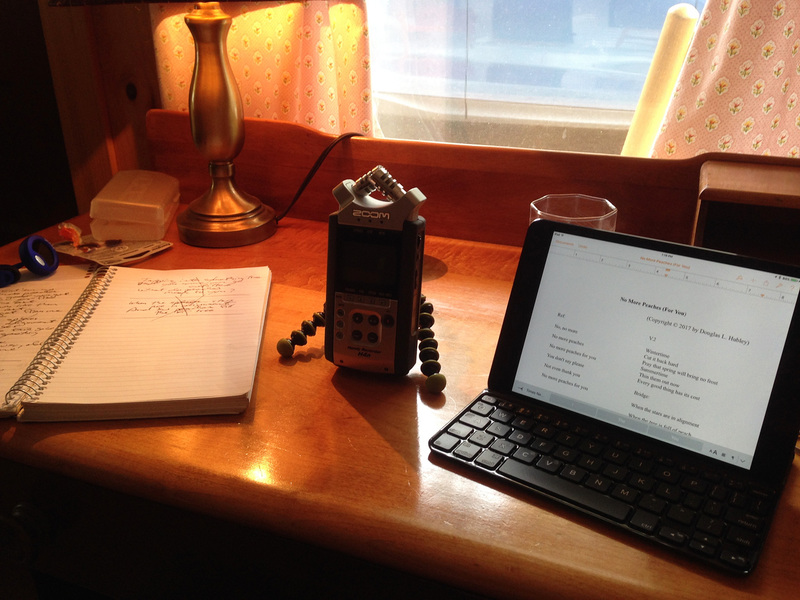 It was an editing position, so-called, at a digital multimedia company in Portland, Maine. 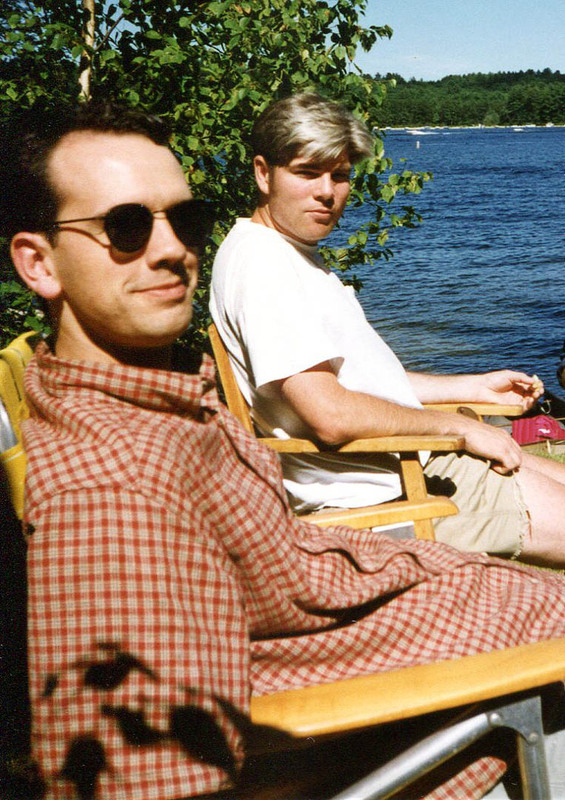 The company developed corporate websites with an emphasis on tourism and video games, among other products — pioneering stuff in Maine in the mid-1990s. Ken’s copy of our late 1998 repertoire, complete with implement notes. Hubley Archives. The firm had its office downtown. 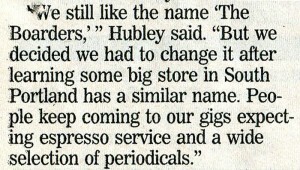 I found out about it during my stint as features editor for Maine Times, an alternative newsweekly that was tottering toward the exit by the time it moved to Portland in 1994. MT and the multimedia firm were in the same building on Congress Street and shared a wall. So even as we at the doomed MT were feeling the mass-media buzz about the brave new world of digital communications, we were hearing the merry laughter of the staff at the multimedia company next door and smelling the delicious English muffins that they toasted each morning. 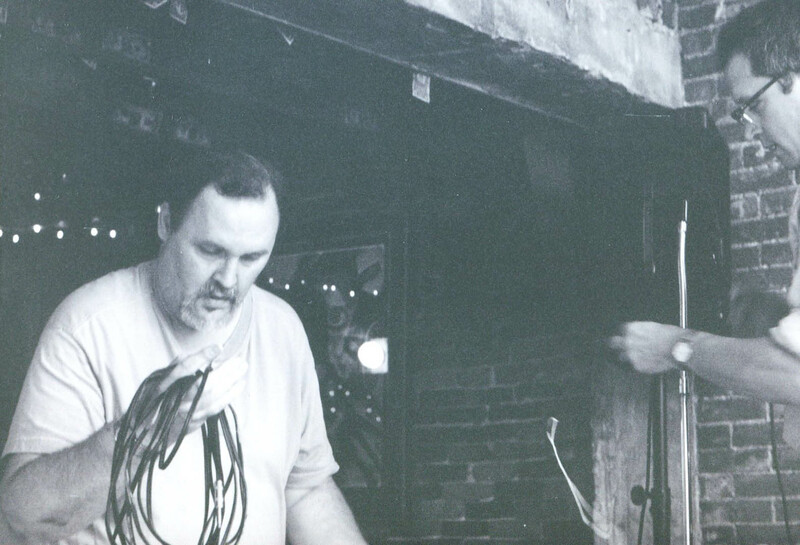 Alden Bodwell and Doug setting up the Turbines stage for a performance at the Free Street Taverna. Photo by Jeff Stanton. Hankering for more merriment and English muffins than Maine Times could provide at that point, in August 1995 I went over the wall and got a job at the multimedia company. Well, so much for merriment and muffins. The multimedia company and I were not a good fit. This I realized only a few weeks in, during an evening of calling state parks in Hawaii to find out how many trails and restrooms they had. Useful work, but not my work. 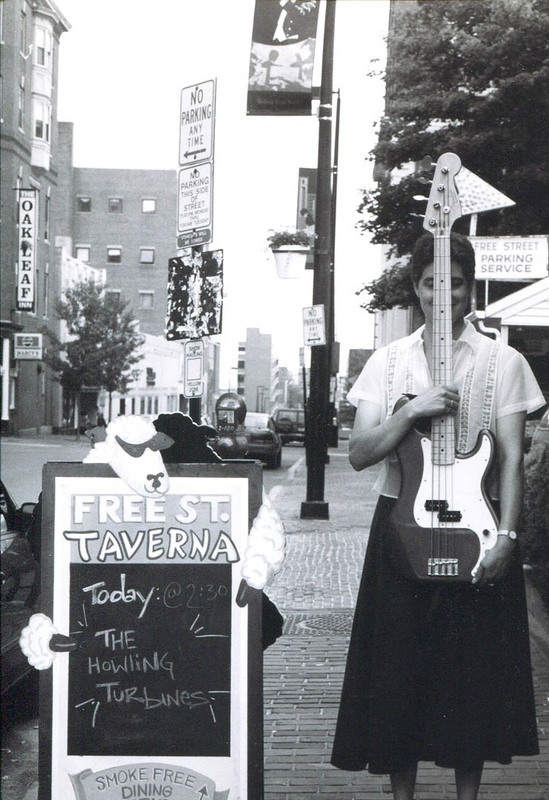 The end of a long hot afternoon: the Howling Turbines back at the rehearsal hall after a 90 F gig at the Free Street Taverna in August 1999. 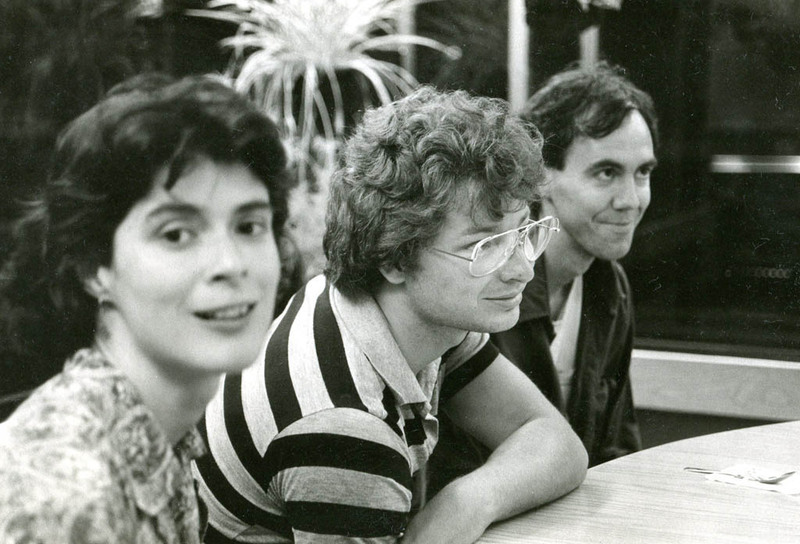 From left: Doug Hubley, Gretchen Schaefer, Ken Reynolds, Alden Bodwell. Photo by Jeff Stanton. I’m not sure when the management realized our poor fit. I suppose it could have been around the time I announced I was taking a leave of absence so that Gretchen and I could travel for six weeks. In any case, I was freelancing again by April ’97 — with both my former employers ultimately among my clients. Once again, I was living up to the mini-bio that followed my published articles — “a musician and writer living in Portland, Maine.” And yep, the band was hot stuff, nuclear batteries to power and Howling Turbines to speed. 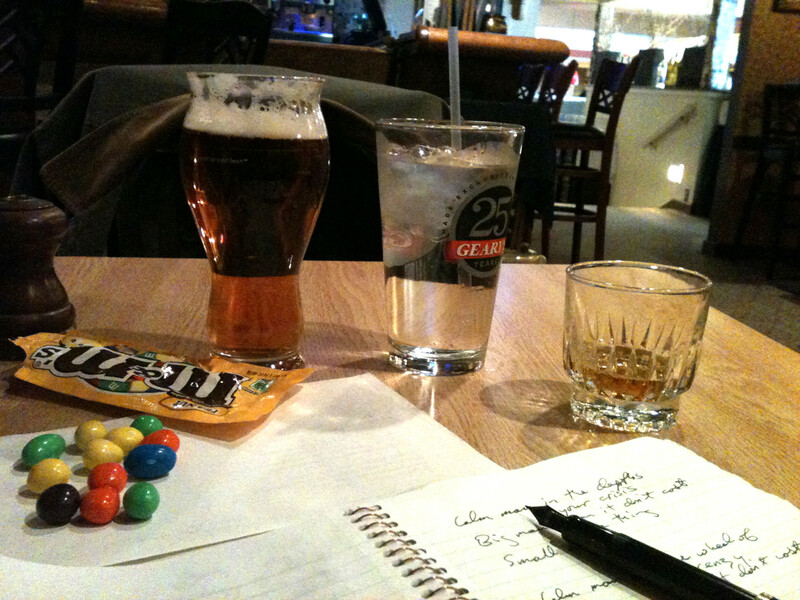 But what didn’t happen much for this freelance writer was songwriting. I wrote two for the Turbines, “Just a Word From You, Sir” in 1997 and “Caphead” in 1998 — and that was it for my songwriting career until 2010. I can’t explain it, at least not definitively. You might think that once I was free-lancing again, it would have been easier to cultivate inspiration and develop a writing routine like real songwriters do. It was a golden opportunity that I somehow failed to seize. Instead, I chased writing and editing assignments — getting some good ones and even a Maine Press Association award — and worried about money. And the Turbines played on. A poster for a 1999 performance. The world won. Hubley Archives. 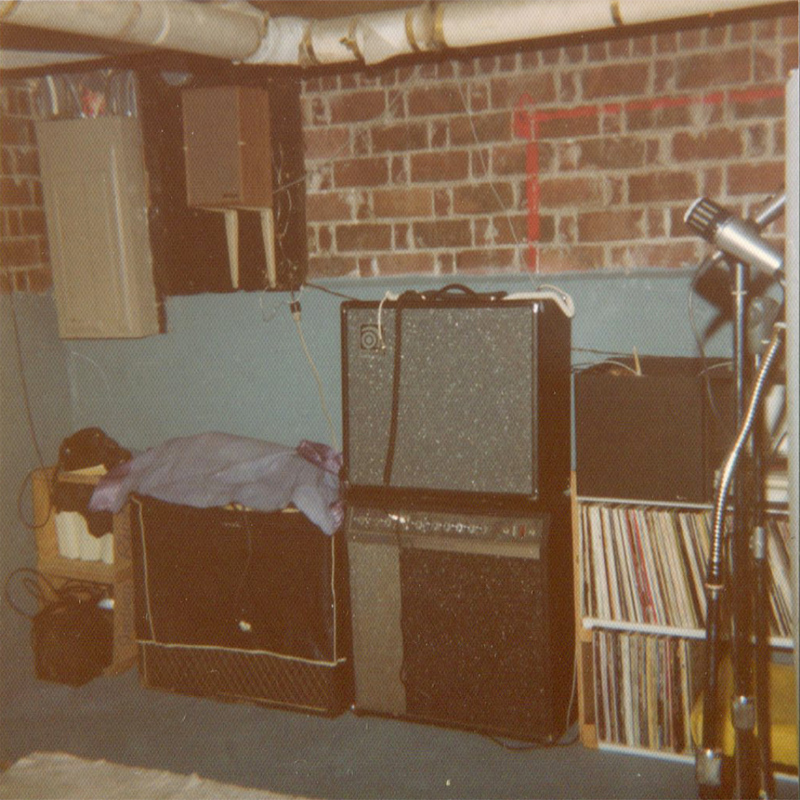 The lack of original material is apparent in this selection of Turbines rehearsal recordings, in which only “Caphead” was written for the band; the rest are holdovers from the Fashion Jungle and the Boarders. See the album in the Nimbit and Bandcamp stores. Caphead (Hubley) In the late 1990s, I started seeing all these young guys wearing ball caps, driving around in tuned Hondas and looking coldly murderous. A fatal fight among some of them in a Denny’s parking lot that year gave me the first verse. This was the last complete song I wrote before a dry spell that lasted until early 2010. 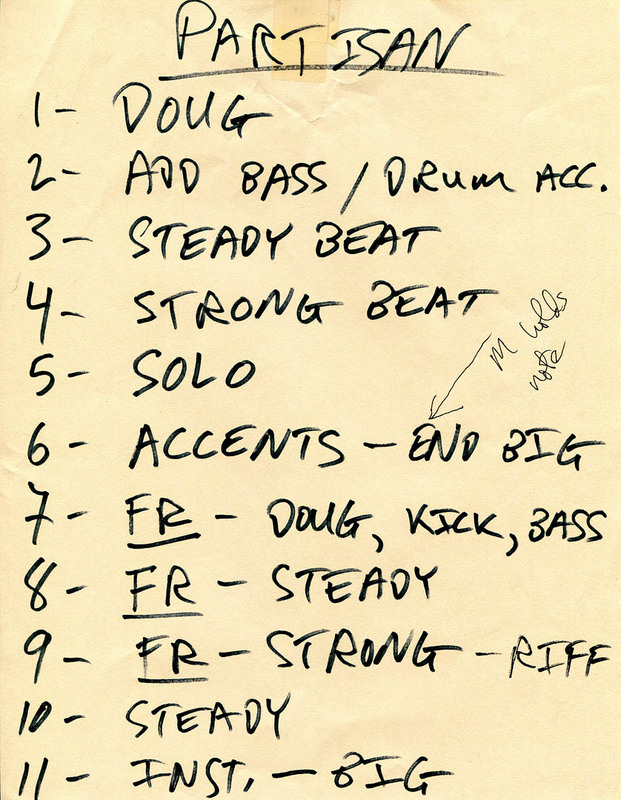 Apologies to “Secret Agent Man.” From a Howling Turbines rehearsal on Aug. 8, 1999. 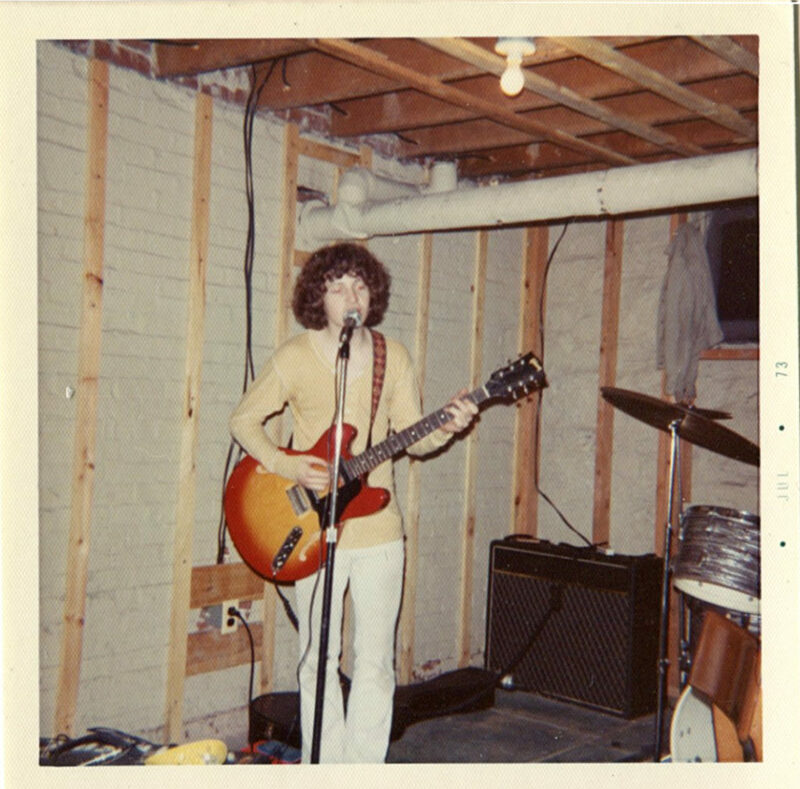 Doug Hubley, guitar and lead vocal. Ken Reynolds, drums. Gretchen Schaefer, bass and vocal. Je t’aime (Hubley) This song is an interpretation, somewhat unfair to her, of an affair I had with a Swedish girl in 1976. I wrote “Je t’aime” in 1982, during the early Fashion Jungle era, revived it for the Boarders and kept it for the Howling Turbines. Aug. 8, 1999. Dance (Hubley) This is the final version of a song that started out in 1988 with the Fashion Jungle in a much different musical setting. Seven years later, when I needed material for the Boarders, I wrote new music for those lyrics because I couldn’t remember the Fashion Jungle’s version and didn’t realize that I had a recording of it, later unearthed. Here it is by the Howling Turbines in a rehearsal on March 22, 1998. Breaker’s Remorse (Hubley) Hearing the expression “buyer’s remorse” for the first time in 1987, I parlayed it into a song for the Fashion Jungle about someone who needs encouragement expressing herself. 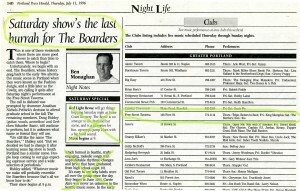 It came back with the Boarders and ended up with the HTs, who recorded this version in 1998 or ’99. “Caphead,” “Breaker’s Remorse” and “Dance” copyright © 2010 by Douglas L. Hubley. “Je t’aime” copyright © 1983 by Douglas L. Hubley. All rights reserved. Notes From a Basement text copyright © 2012-2014 by Douglas L. Hubley. All rights reserved. The swinging new release Obsessive Christmas Disorder makes a great Christmas gift! 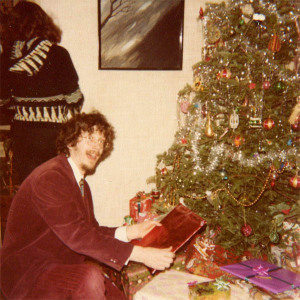 If you were in a band with me back in the day, certain Christmas obligations came with the job. Our news release for the December 1995 Taverna performance. Hubley Archives. My memories of these gigs are fragmentary: shoveling the driveway before a Boarders date that was complicated by the snow. Singing “Santa Claus,” a lyric I wrote to the tune, and inspired by the theme, of Leonard Cohen’s “Joan of Arc.” The Christmas lights against the Taverna’s brick walls and the chilling draft every time someone entered or left. Our friend Jeff Stanton propping himself up at a table as the evening grew late. This Turbines poster for a December 2000 date was a group effort. Gretchen Schaefer created the Santa hats to superimpose on Jeff Stanton’s image of the Howling Turbines, taken at the Free Street Taverna on a 90-degree day. I wrote and laid out the poster. Hubley Archives. 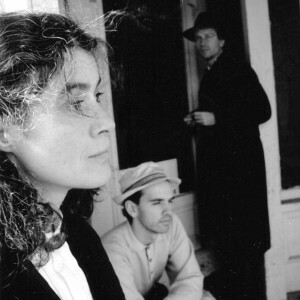 For my bandmates — bassist Gretchen Schaefer, and drummers Jonathan Nichols-Pethick (Boarders) and Ken Reynolds (Turbines) — the Christmas gigs were gigs like others, just more festive and affording the chance to do material different from what we dragged around with us the rest of the year. Instead, I simply have old, random, but deeply felt sentiments for the season, and I simply hoped that I could present them in a way that, like an oddly dressed stranger speaking poor English who shows up in town on Christmas Eve, might elicit some fellow feeling. As a pup I annoyed my family at dinnertime by talking into the telephone and pretending to be Santa Claus’ publicist (which perhaps anticipated my current work, which involves a lot of marketing). In a Christmas gift to all concerned, that phase was short. 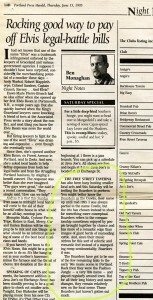 Odd that I was astute enough to know what a publicist did, but not enough to know how annoying I was. Me under the Hubley tree in the mid-1970s. My sister Nancy has her back to the camera. Hubley Family photo. Later there were Christmas concerts with the Mahoney Middle School chorus, during one of which we performed the first song I ever wrote, “For Something’s Happened” — a calling-all-shepherds Christmas carol, though I knew even at age 12 or 13 that I was an atheist. 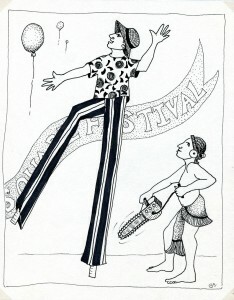 In 1973, the desire to put on a holiday show ascended to a new plane. That autumn, the nation was in the depths of Watergate, the first energy crisis, Vietnam and an emergent hangover from the cultural efflorescence of the 1960s. Gram Parsons and Jim Croce died — and Croce got all the mourning. Who are these Turbines? Read it and find out, if you would be so bold! Hubley Archives. I was unemployed, overweight, drinking too much, mourning my recently broken-up band, hanging around my parents’ basement and pining for romance. Clearly, it was time to put on a show! Somehow — I think through an invitation from the South Portland High School Keyette Club via my friend Patty Stanton — I ended up booked for the SPHS Christmas assembly. No band? No problem! In my infinite ill-founded self-confidence, I used the Sony 540 reel-to-reel and my parents’ cassette deck to create backing tracks — drums, bass and guitar, all ineptly played by me and rendered in distorted meatball-as-pingpong ball multiple tracking — for four songs, which I sang and added live guitar to during the assembly. Not just once, but twice, in ’73 and ’74. 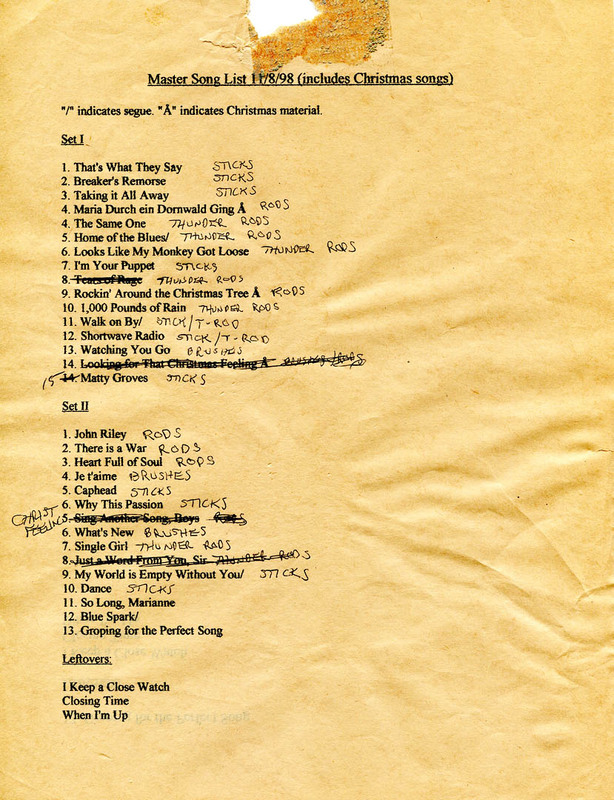 The songs: “White Christmas,” Charles Brown’s “Merry Christmas, Baby,” “Silver Bells” and Elvis Presley’s “Santa Claus Is Back in Town.” That one got some attention, at least according to my tape of the 1974 show. Digitally retouched to increase sentimental value, this is a view across the side yard at 103 Richland St., South Portland, Maine, where my family lived for many years. Harriette H. Hubley photo. For a brief pre-teen period I practiced unspeakable (not perverted, just embarrassing) occult pre-Christmas rituals influenced by Tom Swift Jr. stories and TV spy series. These dictated specifically when I could take my Christmas stocking out of storage, put up my Christmas list, etc., etc. Eventually I absorbed the idea that Christmas involved giving as well as getting. What an adjustment! Maturing at the same time was my innate neurotic responsiveness to deadlines. These traits converged at Christmas season to form compulsive, self-imposed sensations of obligation and urgency. The buildup to the Big Day began to entail gift projects that inexorably led to late-night, last-minute labors that likely bore little relation to the holiday expectations of anyone around me. All these psychological currents flowing through the Christmas season — the urge to perform, the sentimental reverberations, the self-imposed Big Projects — converged and blossomed forth in the Christmas Greeting Tapes, discussed in an earlier post, that I made for friends and family over the course of more than two decades. The front and back covers of the final entry in my CD compilation series, “40 Years of a Basement.” The mosaic is by Gretchen Schaefer. All the songs that I expected my bands to perform at the Free Street Taverna and elsewhere, I had developed or adapted for the Christmas tapes. All this is written in a retrospective tense, but don’t be fooled. True, the Christmas Greeting Tapes are long over with, and no one has offered a Christmas gig to my current band, Day for Night (we’ll take it! Please!!) — but the Christmas projects continue, albeit benefiting from somewhat less OCD and somewhat more refinement. 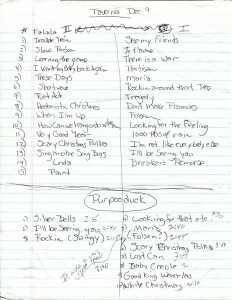 A combined setlist for two Christmastime 1995 Boarders dates: the Dec. 9 Taverna gig and a Rotary-sponsored performance for seniors at the Purpooduc Club. We played very quietly at that one. Hubley Archives. 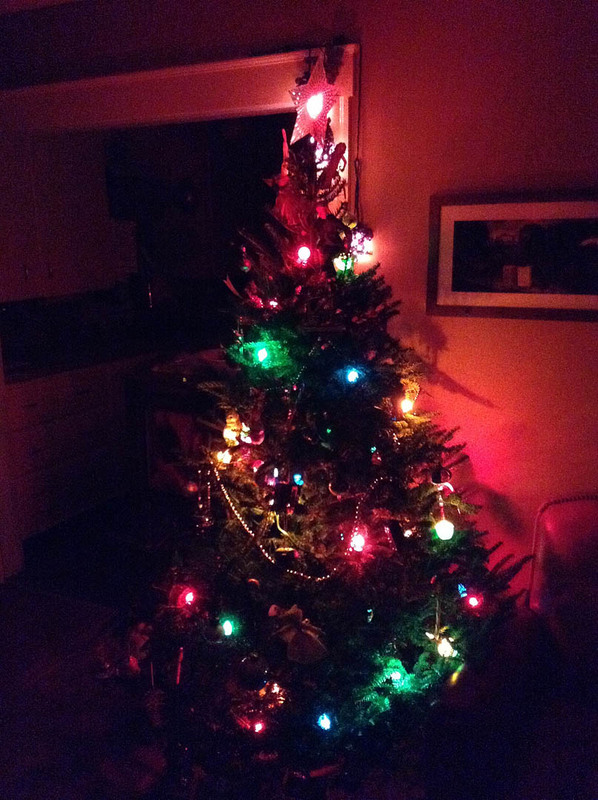 You are reading the latest iteration of them, third in a series of Yule-themed Notes From a Basement blogs. Just prior to starting the blog, from 2005 through 2011, I produced on CD for family and friends annual compilations of music that those friends and I have recorded since the late 1960s. I regret that I remember less about the Boarders and Howling Turbines Christmas performances, offered by a group of musicians for a group of people who wanted to hear what we were doing, than I do about the somewhat onanistic projects that preceded them by 20 years and more. And I would like to know more about our audiences’ responses to them, as that perhaps was a context in which my responses to Christmas made most sense. Well, there’s always the WordPress comment option, folks. I’d love to hear from you. Meanwhile, another Christmas season is just beginning (or, according to whom you ask, several weeks along). A tree fell on our garage during the Nov. 26-27 snowstorm — we don’t yet know the damage but at least Gretchen was able to work in her studio, at the back of the garage, today — and I hurt my back shoveling snow, putting an end to my long-held conviction that I would never have back trouble. Yet in a sign of progress, I feel grateful that in spite of all, we continue to enjoy great good fortune. And yes, I still feel vestigial stirrings of the old incoherent Christmas nostalgia, the deadline obsession and the need to show off in a seasonally appropriate way. I say to those feelings and to you who have come this far reading about them: fond greetings, old friends. And to you who are reading, I also wish contentment with, or at least acceptance of, your own Christmas complications; and much happiness in the company of those who stay with you in spite of them. 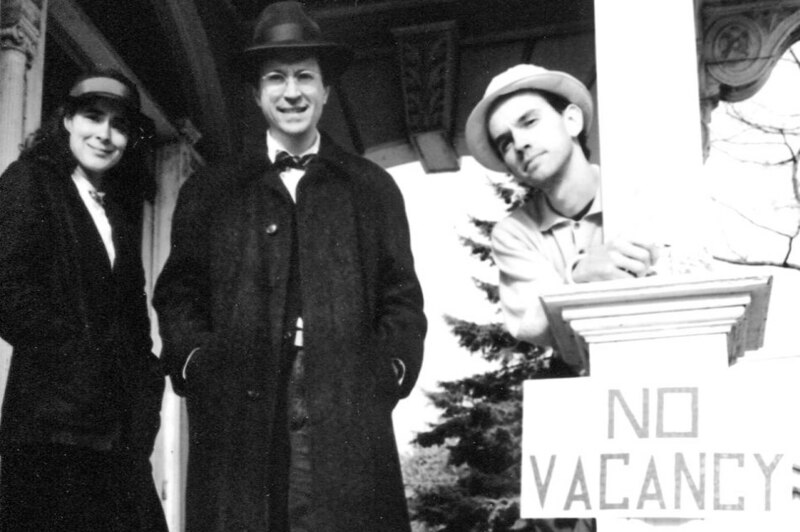 The Boarders in an autumn 1994 Boarders publicity shoot by Jeff Stanton. Hubley Archives. Compare and contrast! Available on Nimbit and Bandcamp, hear The Boarders and the Howling Turbines offer their distinctive interpretations of a few holiday numbers. As an added bonus, or something, there are two accordion numbers and an excerpt from the 1984 Christmas Greeting Tape. 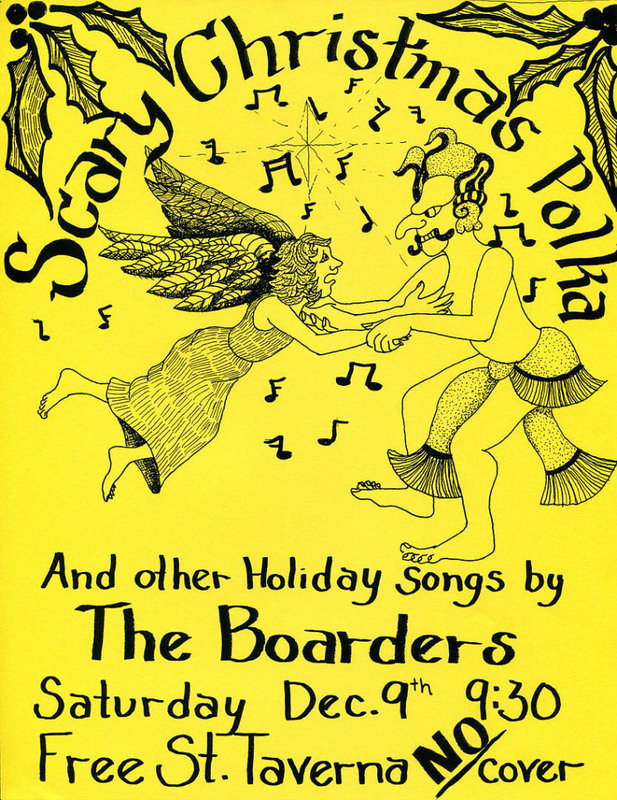 Looking for That Christmas Feeling (Hubley) This performance is by the Boarders, in a Dec. 6, 1995, rehearsal for our Christmas date at the Free Street Taverna. Doug Hubley, guitar and vocal. Jonathan Nichols-Pethick, drums. 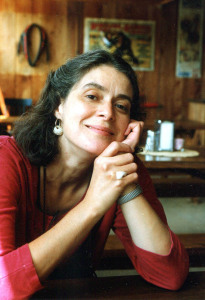 Gretchen Schaefer, bass. Song note: In December 1981, I was stressed by finals and the demise of my current band, the original Fashion Jungle —but also all electrified by my new affair with Gretchen. That peculiar tension informs this song exploring the longing for some kind of meaning to Christmas that didn’t involve, well, Christ. Like “Shortwave Radio,” also from 1981, this involves closely personal imagery (I drank a lot of Freixenet that year), but I nevertheless hope it is somehow meaningful to others as well. The intro came later, in 1984 — coincidentally, again coinciding with the dissolution of a Fashion Jungle seemingly poised on the brink of success. 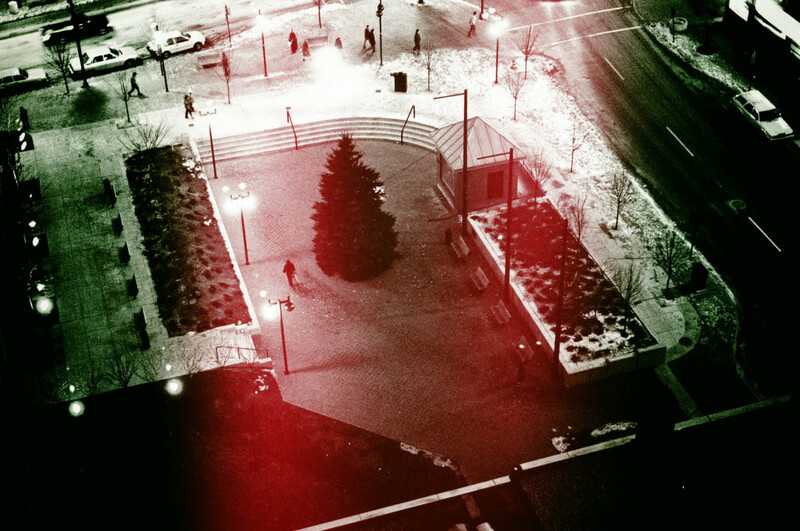 The opening image was provoked by a spell of December warmth that had me worried about global warming even then. “Looking for That Christmas Feeling” copyright © 2010 by Douglas L. Hubley. All rights reserved. Maria Durch ein Dornwald Ging (trad. German) In the late 1980s I abandoned the skit+music format of my Christmas Greeting Tapes and instead produced little compilations of Christmas music played on accordion. Recorded on a Sony Walkman through a mic the size of a bullion cube, this is a solo performance of a German carol from the 15th or 16th century. The words depict Mary, pregnant with the Birthday Boy, wandering through a thicket of seemingly dead roses (a “thorn woods”) that burst into flower as she passes. Recorded Dec. 21, 1988. Maria Durch ein Dornwald Ging (trad. German) From an Oct. 10, 2001, rehearsal by the Howling Turbines. Doug Hubley, guitar and vocal. Ken Reynolds, drums. Gretchen Schaefer, bass. Song note: This German carol made a very fine addition to the holiday repertoires of both the Turbines and the Boarders, which first developed the electric version (see below). Sel bych rad k Bethlemu (trad. Czech) Another accordion piece from the music-only Christmas tapes. The title of this Czech carol means “to Bethlehem I would go” and the lyrics are aimed at children. I liked the tune and, added bonus, I could play it. Also recorded Dec. 21, 1988. 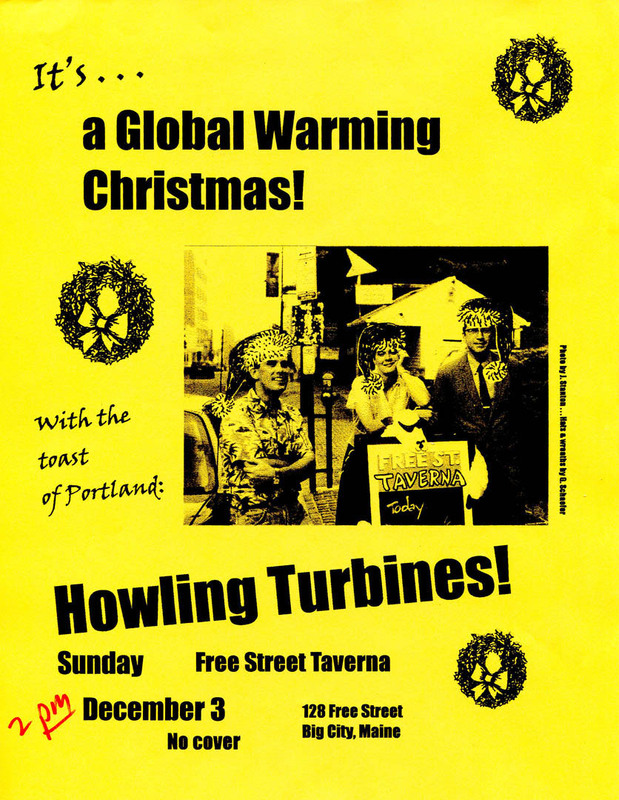 Looking for That Christmas Feeling (Hubley) The Howling Turbines on Oct. 10, 2001, rehearsing for a Christmastime date at the Free Street Taverna. Doug Hubley, guitar and vocal. 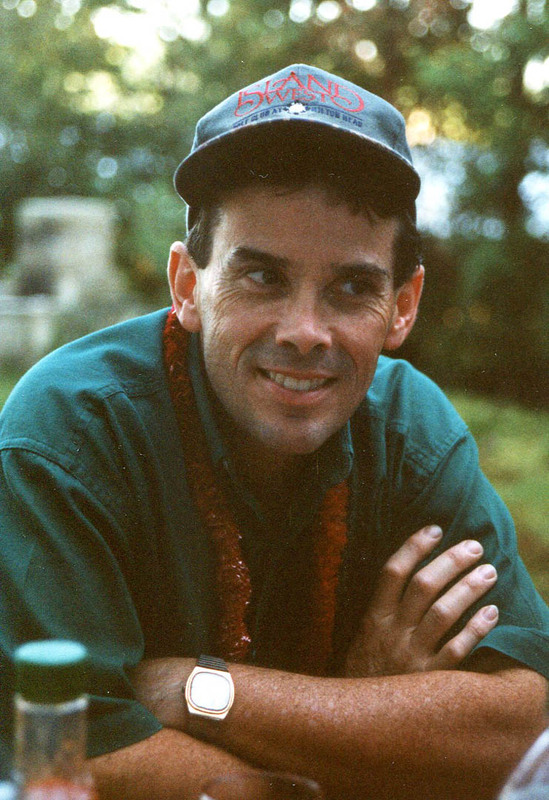 Ken Reynolds, drums. Gretchen Schaefer, bass. 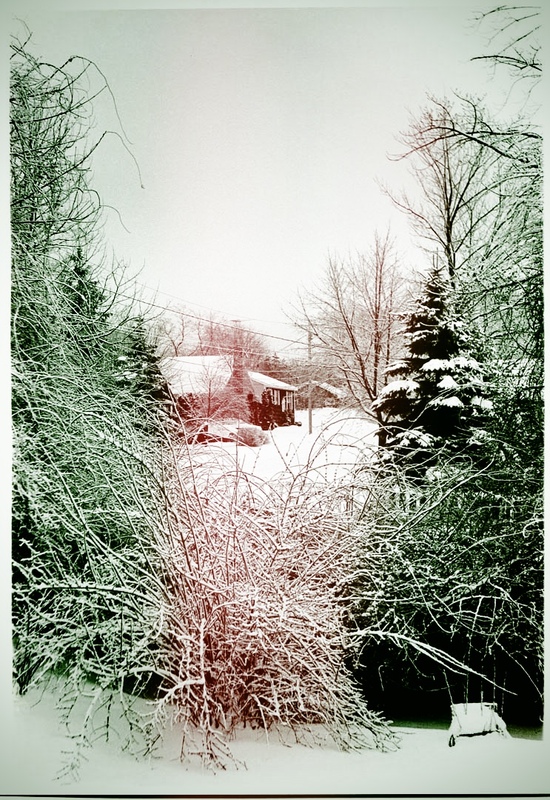 “Looking for That Christmas Feeling” copyright © 2010 by Douglas L. Hubley. All rights reserved. Maria Durch ein Dornwald Ging — The Boarders, rehearsing on Dec. 5, 1995, for a Free Street Taverna gig a few days hence: Doug Hubley, guitar and cheezy double-tracked vocal. Jonathan Nichols-Pethick, drums. Gretchen Schaefer, bass. “Coffee With Doug”: Christmas Around the World — An excerpt from one of the more successful entries in the Christmas Greeting Tape series, from 1984. “Notes From a Basement” text copyright © 2012–2014 by Douglas L. Hubley. All rights reserved. 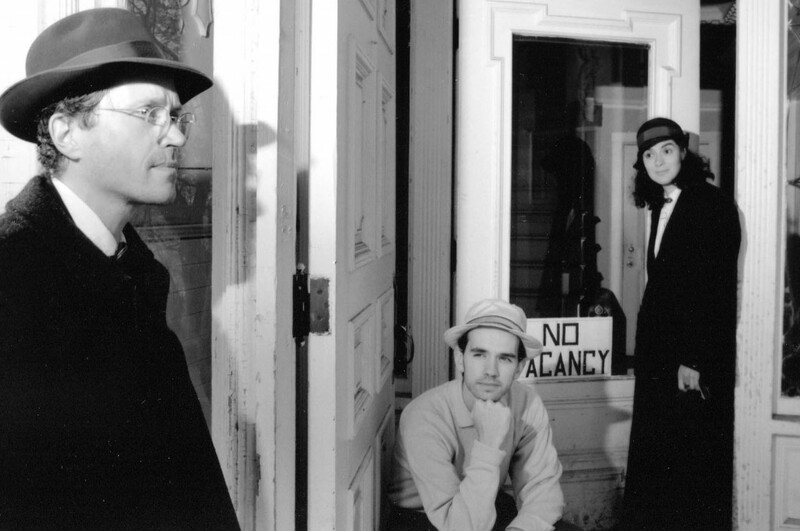 The Howling Turbines looking skeptical in an early publicity shot by Jeff Stanton, circa 1998. From left: Doug Hubley, Gretchen Schaefer, Ken Reynolds. Hubley Archives. 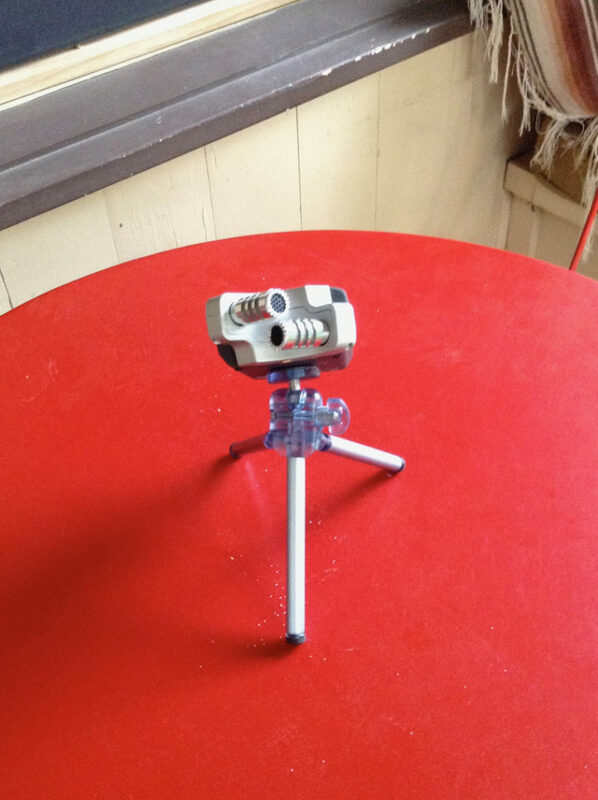 Enjoy the champagne-bubble sounds of Howling Turbines on the Nimbit Internet! A poster for a 1999 performance. Hubley Archives. Gretchen Schaefer and I are Louis Jordan fans. So we were pleased, if surprised, by Ken Reynolds’ invitation to see the jukebox musical Five Guys Named Moe, based on Jordan’s jumping R&B, at the Ogunquit Playhouse in August 1996. 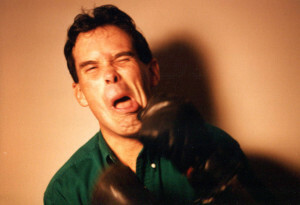 Ken seemed to take the theme quite seriously in this outtake from the 1998 boxing-poster photo session. Hubley Archives. Surprised in part because Gretchen and I almost never go to musicals, but in larger part because the invitation from our longtime friend and former bandmate seemed like some kind of overture. “Is Ken asking us on a date?” we wondered. 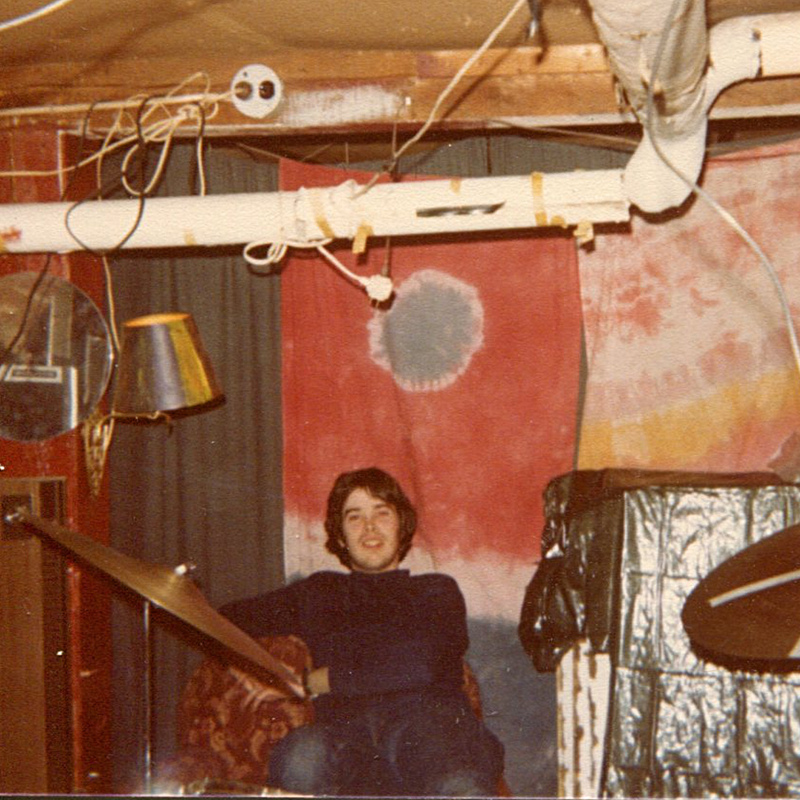 I have known Ken, who is a drummer, since 1975. We met while working in the stockroom at Jordan Marsh at the Maine Mall, and found that our senses of humor really meshed. Three Stooges and Monty Python seemed very insidery in Portland, Maine, in the mid-1970s. We became good friends. Gretchen in an outtake from the 1998 boxing-poster photo session. Hubley Archives. 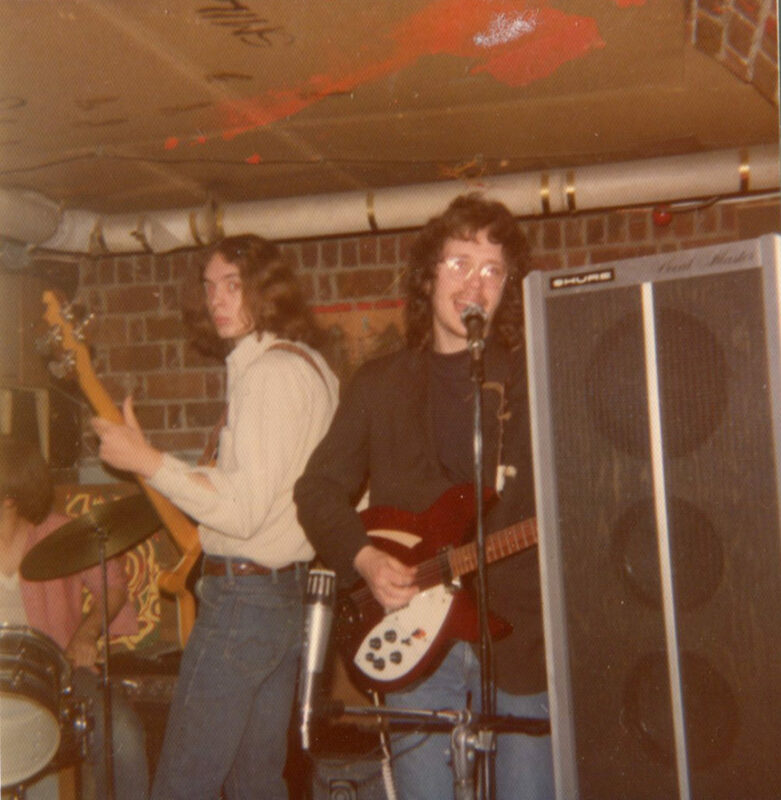 Our musical relationship started in 1977 with the Curley Howard Band, and we played together on and off until 1991, when Ken left the Cowlix. In that countryish band, Gretchen played guitar and bass, and I played guitar and accordion. 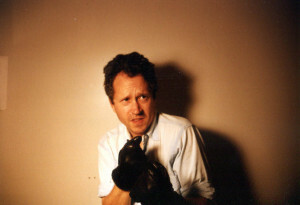 Doug Hubley strikes a pose that would intimidate even Wally Cox in this outtake from the boxing-poster session. Hubley Archives. Through all the musical comings and goings, our longtime friendship with Ken had remained solid. But Ken’s invitation to drinks, dinner and a show (his family had season tickets at the playhouse) was an order of magnitude or two higher than our crowd’s usual frolics. 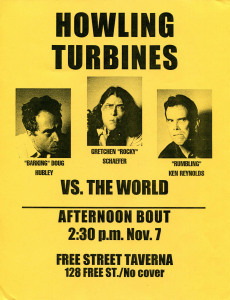 Gretchen Schaefer and I were calling ourselves “Howling Turbines” before Ken Reynolds returned as drummer. 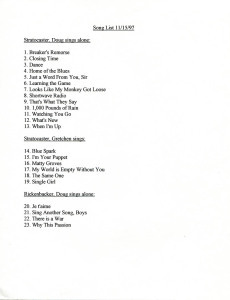 This song list bridges the two periods; the songs in black ink, we learned with Ken. The acoustic material of the interrim, such as Leonard Cohen’s “The Bells” (listed here as “Take This Longing”) didn’t last into the Turbines. Hubley Archives. The occasion gave us more time to talk than usual and it was good to get caught up with Ken. I remember sitting in the sun on Barnacle Billy’s patio as Ken told us that he had taken up drums again, performing at a church. He was happy to be playing although the congregation was fractious and, I think, split up either just before or just after Ogunquit. 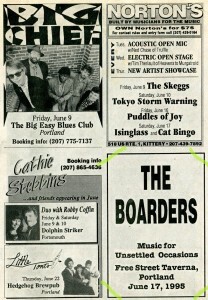 Speaking of split-ups, this get-together was only a month or so after Jonathan Nichols-Pethick had left Gretchen’s and my band, the Boarders. While Jon’s departure had left us without a drummer, it also left us with ideas for new things to try — notably for Gretchen to sing more and for us to try some harmonies. 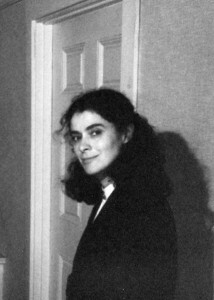 An ungloved Gretchen in 1998. Hubley Archives. In the months after Jonathan and his wife, Nancy, lit out for Indiana, Gretchen and I tried out new material, from the Carter Family to Leonard Cohen, and also set the electric instruments aside and played acoustic guitars — anticipating our current band, Day for Night, by about 10 years. In between the Boarders and Day for Night, though, there was another electric (and how!) band. 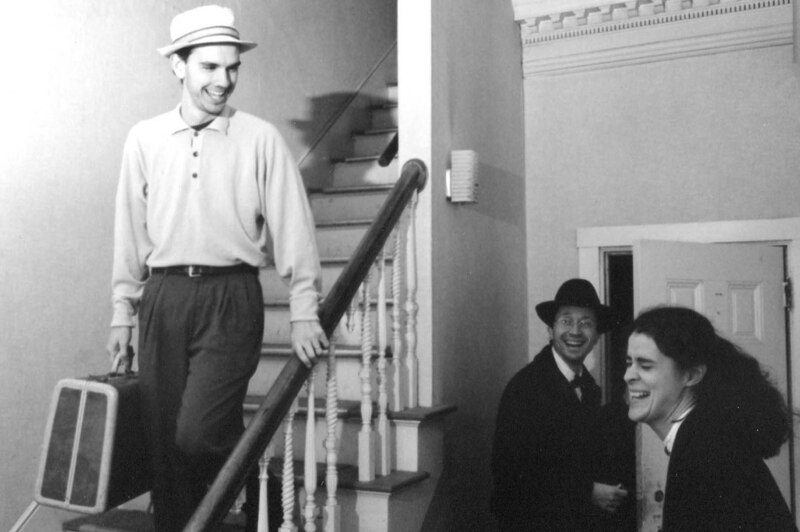 I can’t remember the specifics, but sometime between our Ogunquit evening and our first rehearsals in early 1997, the three of us agreed that it would be a good idea for Ken to come back. And the Howling Turbines were born. Ken Reynolds in the late 1990s. Photograph by Jeff Stanton. 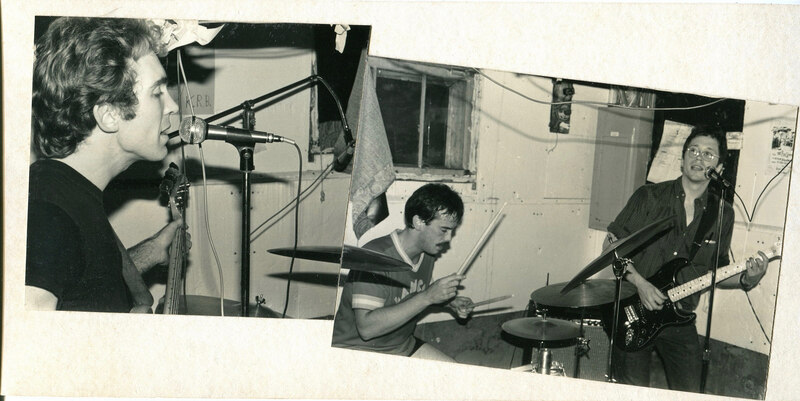 Ken hauled his drums back down into the basement in February 1997, 20 years to the month after he and I first started making music together. I remember the distinct pleasure I felt as the three of us got the ball rolling again. We knew each other well, personally and otherwise, and it didn’t take long to find our sound. Which was not the Boarders’ sound. The two bands shared a format: the classic three-piece lineup of bass, drums and guitar. They shared a certain amount of material, and they shared Gretchen and me. 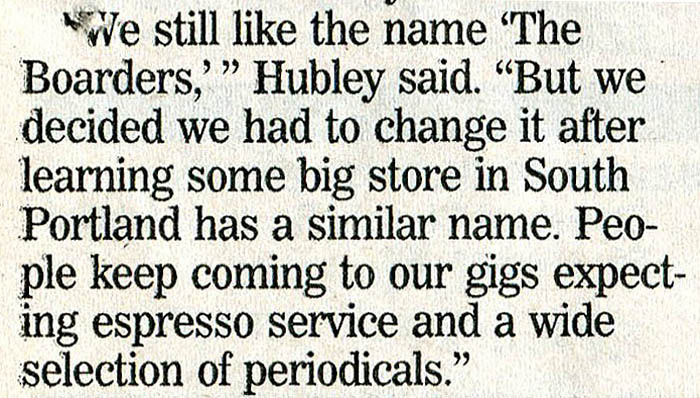 But the sonics were quite different. making the three-piece format work. Your author in a film selfie, shot in the bedroom mirror in 1999. Notice the Concord Coach schedule tucked in the mirror frame in case we needed to make a quick getaway. Hubley Archives. Jonathan kept a great beat, but brought a light touch and a lot of ornament and texture to the instrumental fabric. With perhaps a decade of experience over Jon, by this point Ken was a much sparer stylist. 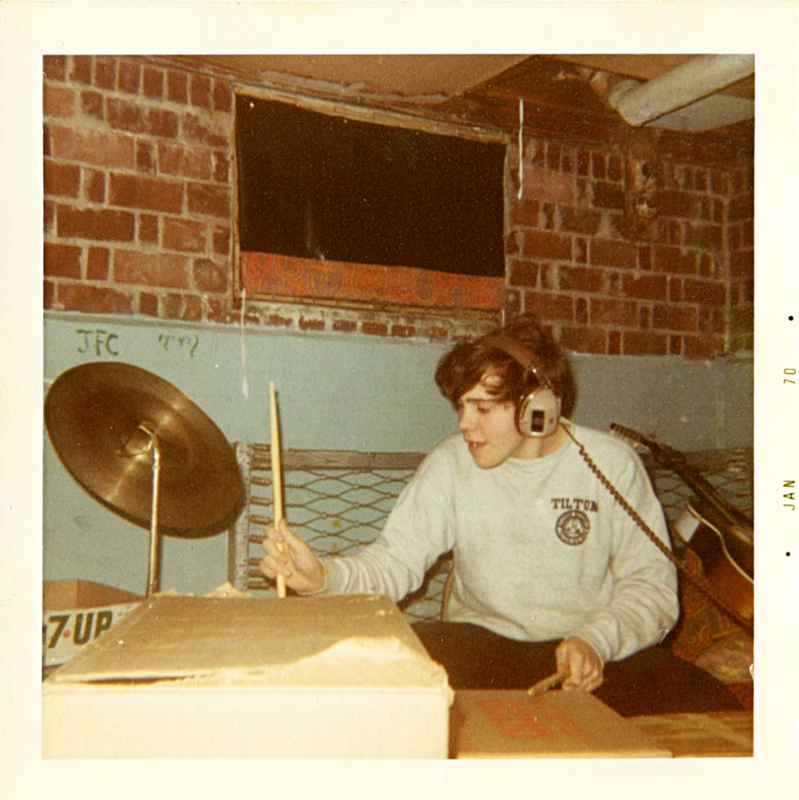 He brought a relentless focus to the beat and an almost mathematical sense to his fills. Interestingly, Ken also worked his tom-toms, especially the floor tom, much harder with the Turbines than with our previous groups. Their kits sounded quite different, too. Jon was playing a Yamaha set that had a mid-weight sound. Ken, meanwhile, had left his original Ringo Starr-model Ludwigs behind and brought in a massive set of silver-gray Pearls that fairly bristled with chrome pipes and mysterious fittings. That was a kit that invited heavy whacking. Vocals made the other big difference between the Boarders and the Turbines. Where Gretchen had one vocal number with the earlier group, she did lead or harmony vocals on much of the Turbines’ repertoire, including through-harmonies on songs like “Matty Groves,” which we had worked out prior to Ken’s return. Ken later picked up some lead vocals, too. The simple fact of additional voices added a welcome new dimension to the Turbines’ sound. 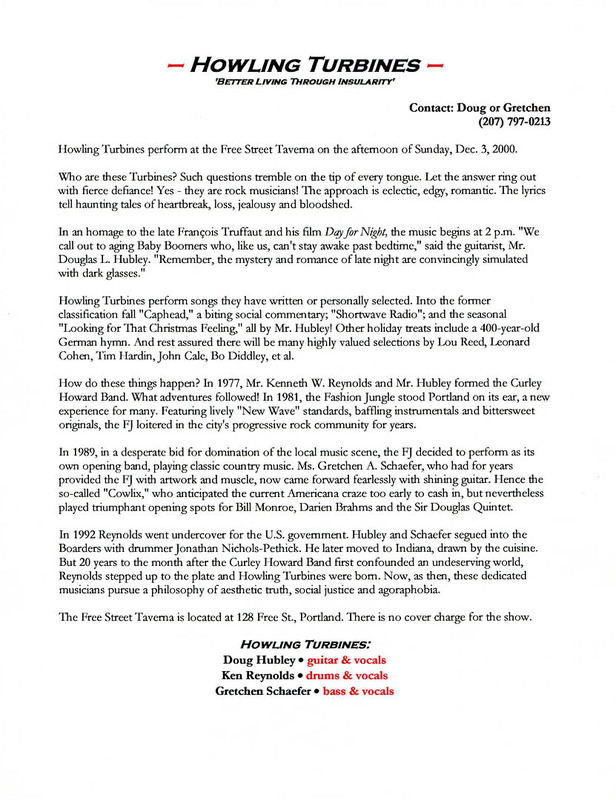 The Howling Turbines repertoire in November 1997. Ten of the 23 songs were new to the Turbines. Hubley Archives. There was one other sonic supplement that is ridiculous to mention except for the fact that it had such a big effect. 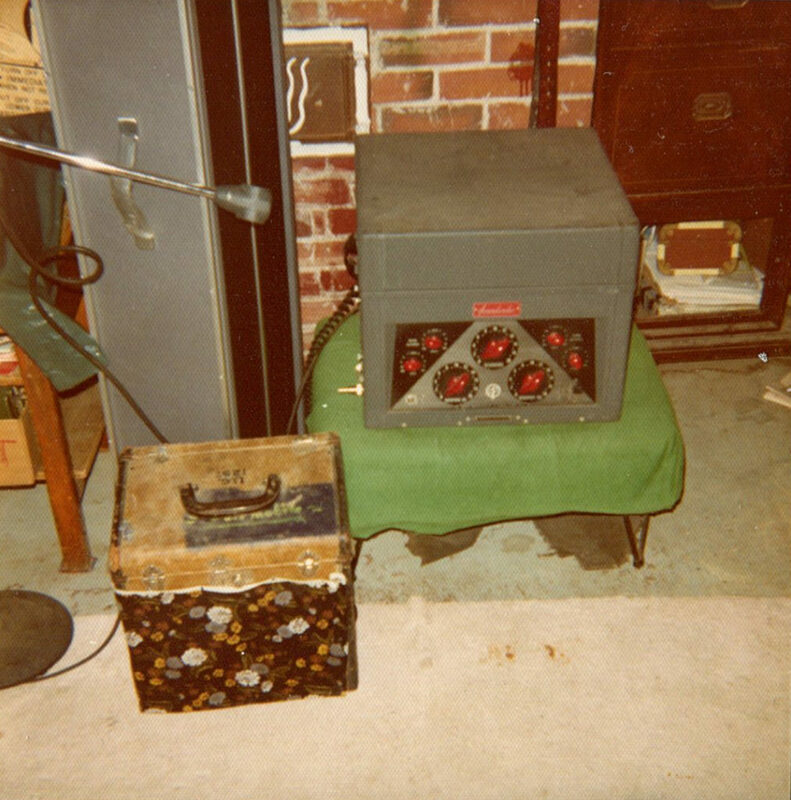 Actually, it was a big effect: a Danelectro “Daddy O” overdrive box that opened up a whole new world of noisemaking to me. I had been using a compressor for the big big sounds — and now the Daddy O enabled me to be not just loud, but abrasive! Heavy drums, more vocals, metal guitar. Gretchen and I had been playing around with the name “Howling Turbines” before Ken came back (it was that or “The Lager-Rhythms”). But these Turbines really did howl. Another slice of the Turbines team. From left, photographer and longtime friend Jeff Stanton, Gretchen Schaefer, Ken Reynolds. Photo by Doug Hubley. Just a Word From You, Sir (Hubley) One of two songs I wrote for the Howling Turbines, this was an attempt to capitalize on what I perceived as our heavy-rock potential. Generally about my relationship with authority, it’s specifically about Stalin, Leonard Cohen and God. Go figure. A rehearsal recording from March 1998. Copyright © 2010 by Douglas L. Hubley. All rights reserved. 1,000 Pounds of Rain (Hubley) The title was inspired by a 1990 Cowlix performance at the Drydock, for which — so as not to disturb the fried-clam scarfing multitudes — we had to carry the equipment to the second-story performance area up a cast-iron fire escape in a pouring rain. I lugged the title around for years not knowing what the song would be about. Finally finished in spring 1994, around the time the ‘Lix were splitting up, “1,000 Pounds” turned out to be a cry of despair at reaching middle age. This is one of a number of tunes that we carried over from the Boarders to the Turbines. 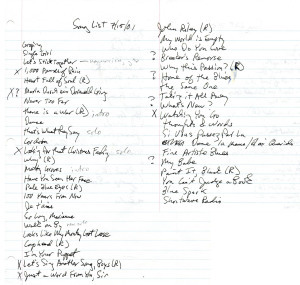 A rehearsal recording from June 1, 1997. Copyright © 1995 by Douglas L. Hubley. All rights reserved. Shortwave Radio (Hubley) Leonard Cohen once told an interviewer something to the effect that performing “Bird on a Wire” reminded him of his duties somehow. “Shortwave Radio” plays a similar role for me. I started writing the lyrics in an art history class at USM in 1981, and finished the song up over a gin gimlet in my sister’s living room on a summer evening, Bob Newhart on the TV, volume muted. This stayed in the repertoire for more than 20 years, from the Fashion Jungle to the Boarders to the Turbines. 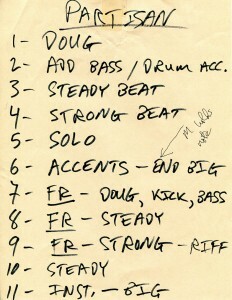 A rehearsal recording from May 1998. Copyright © 1982 by Douglas L. Hubley. All rights reserved. 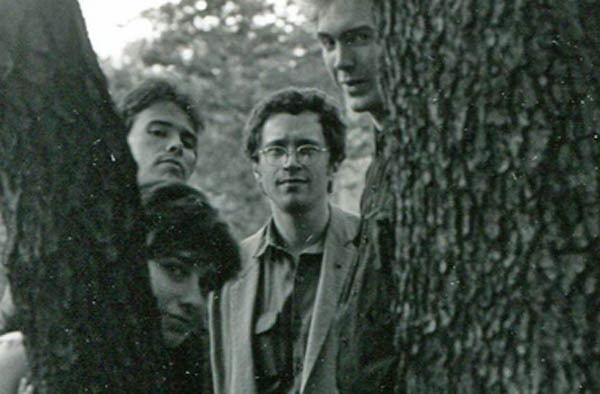 Groping for the Perfect Song (Hubley) Like “Shortwave Radio,” “Why This Passion” and others, this early Fashion Jungle number seemed primed for a comeback when drummer Ken Reynolds rejoined bassist Gretchen Schaefer and me to form the Turbines. In this rough rehearsal recording I manage to goof up some lyrics including the signature opening line (hence the discount on this track on the Bandcamp and Nimbit stores). I derived some sort of early inspiration for this from David Byrne, but that didn’t last. A rehearsal recording from March 1998. Copyright © 1983 by Douglas L. Hubley. All rights reserved. Matty Groves (Traditional) Howling Turbines bassist Gretchen Schaefer and I devoted one of our first through-harmony efforts to this very old British folk song. It’s such a country tune! The success of this early HT staple encouraged us to try a few other folk songs like “John Riley” and “Pretty Polly,” but this was always the best of the lot. 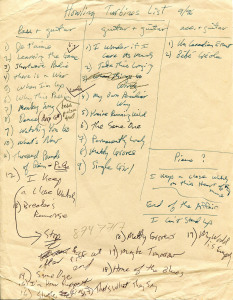 A rehearsal recording from June 1, 1997. Notes From a Basement text copyright © 2012–2014 by Douglas L. Hubley. All rights reserved. I see you standing on the other side. I don’t know how the river got so wide. 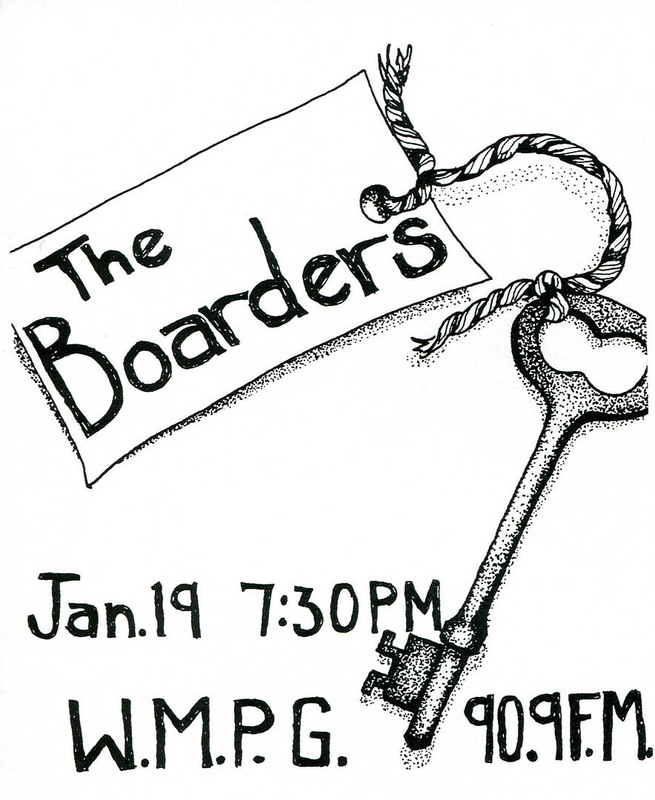 Hear fabulous Boarders tunes at Bandcamp! Why not humor the old man and buy the album? Our farewell to drummer and good friend Jonathan Nichols-Pethick was extended and cordial. Considering how sorry we were to watch Jon go, that was a jolly good show on the part of bassist Gretchen Schaefer and me, the other members of the Boarders. Bassist Gretchen Schaefer created this image to promote the band’s WMPG-FM performance in 1996. The key harks back to our marketing campaign in 1994. 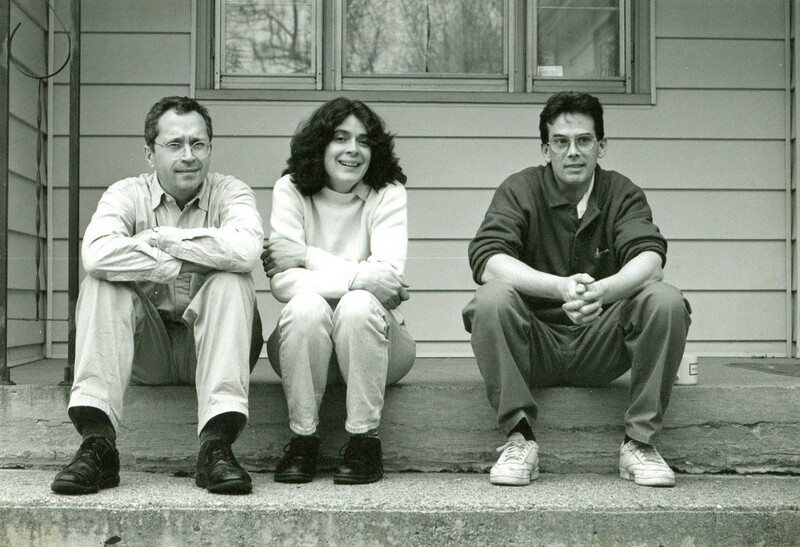 As I recall, it was during the winter of 1995–96 that Jon announced that he and his wife, Nancy Nichols-Pethick, would be leaving for Bloomington, Indiana, and graduate school in July, soon after Nancy’s graduation from the University of Southern Maine. 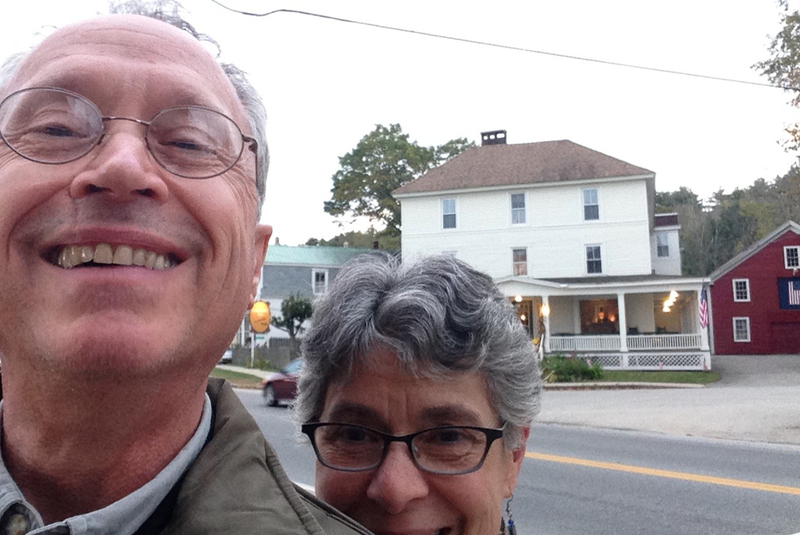 He wanted to teach communications, she wanted to teach art, and the grad programs they wanted were not in Maine. was seldom found in Portland. 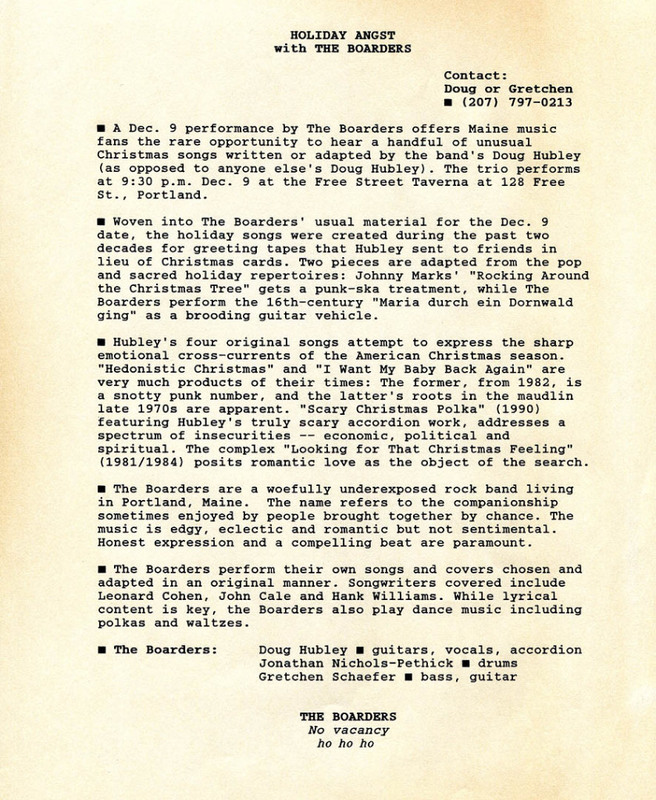 Press Herald music columnist Ben Monaghan on the Boarders’ swan song. Hubley Archives. We kept our standards high right through the bitter end. 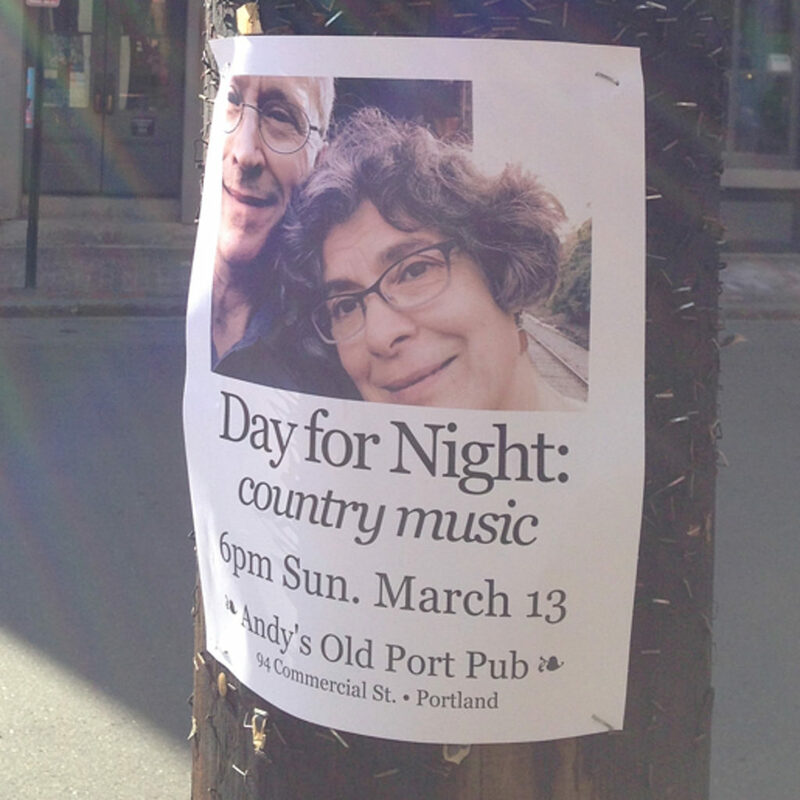 Final gigs included the highly unusual (for us) occasion of a live radio performance in January on “Local Motions,” a program dedicated to Portland-area musicians on WMPG-FM, the University of Southern Maine radio station. For his Press Herald column about the Boarders’ final concert, Ben Monaghan pulled this quote directly from my news release. That was a hair-raiser: We played well enough, but the wind howled, the rain poured down and the WMPG sound engineer managed to lose Gretchen’s bass almost completely in the mix, while helpfully adding unneeded digital effects. In this 1994 publicity image, the long faces were just a pose. Fifteen months later, we were wearing them for real. Photo by Jeff Stanton. We returned to our spiritual home, the Free Street Taverna, for a couple of dates including our final performance, in July. Close to the end of that gig, accompanied by Gretchen’s bass and some poorly chosen sounds from my accordion, Jonathan played my Stratocaster and sang Woody Guthrie’s “So Long, It’s Been Good to Know You,” with some lyrics of his own. And that was that for the Boarders. The long goodbye included a joint yard sale at our place with the Nichols-Pethicks so they could liquidate possessions prior to their move; a farewell dinner downtown; and their going-away party at a friend’s lakeside camp. I still remember when the Nichols-Pethicks stopped at our house on their way out of town for the last time. It was good to know Nancy and Jonathan, and happily we still do, though we don’t see them often. Eighteen years after the Boarders, they are still in Indiana, living in Terre Haute with their children, David and Trinity. Nancy has taught painting and drawing at Indiana State University since 2003. She devoted her sabbatical last fall to making an acclaimed series of paintings of the Wabash River. Jon Nichols-Pethick, left, at the July 1996 going-away party for him and Nancy Nichols-Pethick. At right, Scott “Diesel Doug” Link, whose band, the Long-Haul Truckers, used to perform the song “All Over,” which Jon (mostly) and I wrote. Hubley Archives. Jonathan wrote a book about television police shows, TV Cops: The American Television Police Drama (Routledge, 2012). He teaches film and media at DePauw University and just this month became director of the Media Fellows Program and the Eugene S. Pulliam Center for Contemporary Media at DePauw. Though our lives are now far apart and our connection derives from being in bands together long ago, it interests me to think about how we continue to relate to each other. Nancy and Gretchen are both visual artists, for example. And my day job at a small Maine college often involves publicizing faculty achievements like Jon’s new appointment or Nancy’s Wabash paintings. I’ve been told by other former musical colleagues that they might have stayed around if there’d been more happening with the band. Would that have held true for Jonathan? Obviously a question for him to answer, but I suspect that the Nichols-Pethicks would have left town anyway. It’s generational, right? They are about 10 years younger than Gretchen and I, so when the Boarders broke up they were doing only what we had done 10 years earlier: doing what they needed to do to get established in their careers. 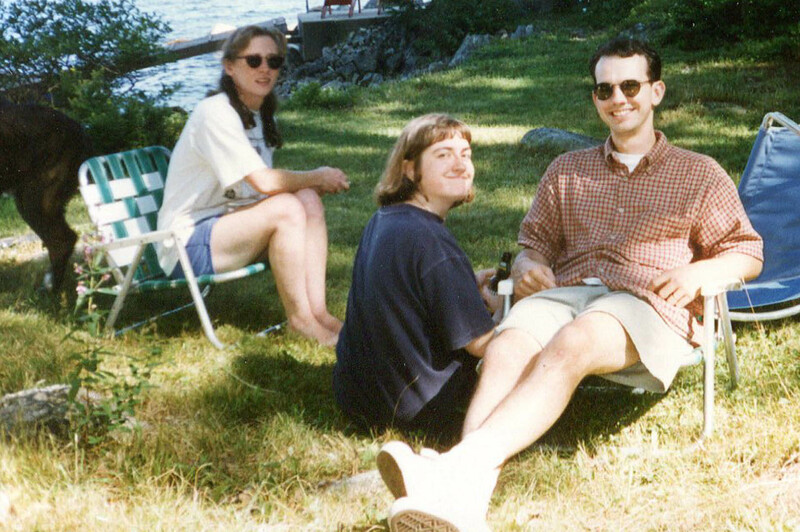 At the time of the Boarders, Gretchen and I were just settling into lives that, 20 years later, haven’t changed that much. But Jonathan and Nancy were preparing for takeoff. What’s so funny (about Jon, Doug and Gretchen)? Jeff Stanton photo. One difference, though, involves intentionality. Gretchen and I had career dreams that glowed in the distance like Boston’s Citgo sign, but never took a straight path toward them. We fumbled around for years until we finally found situations that seemed to work. The Nichols-Pethicks, on the other hand, seemed to have their eyes on the longer-term goal ever since we knew them. They chose what they wanted, went for it and got it. In a different way, maybe that’s generational too. Most of my contemporaries have career histories as haphazard as mine, but few of the younger people I meet do — and the younger the acquaintances, the more linear the resume. So our drummer was gone. 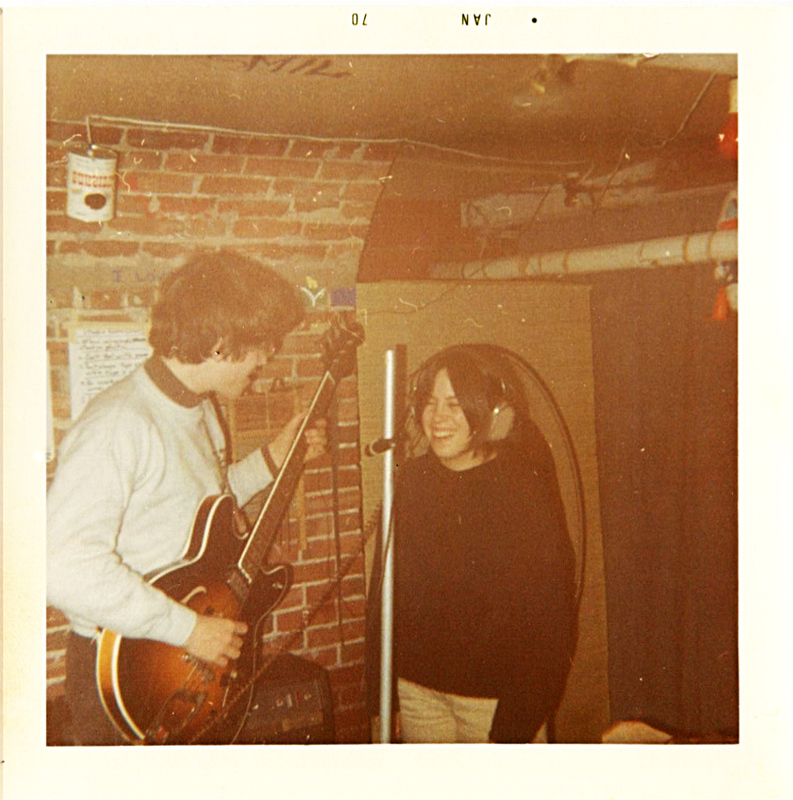 But during the ensuing months, Gretchen and I continued to make music. Thinking we might not have another drummer, we went acoustic and turned to country music and close harmonies — pretty much what we’re doing now as Day for Night. I have a vivid memory of us playing acoustic guitars in the living room and singing the Carter Family’s “Bury Me Beneath the Weeping Willow.” We worked on Leonard Cohen’s “The Bells” and Willie Nelson’s “Permanently Lonely,” among other songs, and we considered calling ourselves The Lagerhythms, a name I had wanted to use since the Cowlix days. But there was one more electric band to come, made possible by the surprising return of an old friend. 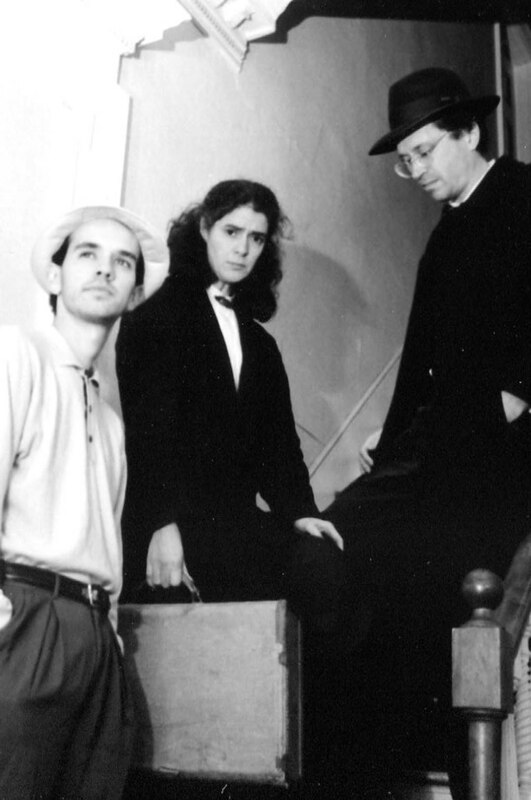 Hear the Boarders in rehearsal recordings, and one live performance, from 1995–96. These five recordings from rehearsals, plus one from a live radio broadcast, capture The Boarders in the last six months of our time together. Shortwave Radio (Hubley) Leonard Cohen once told an interviewer something to the effect that performing “Bird on a Wire” reminded him of his duties. 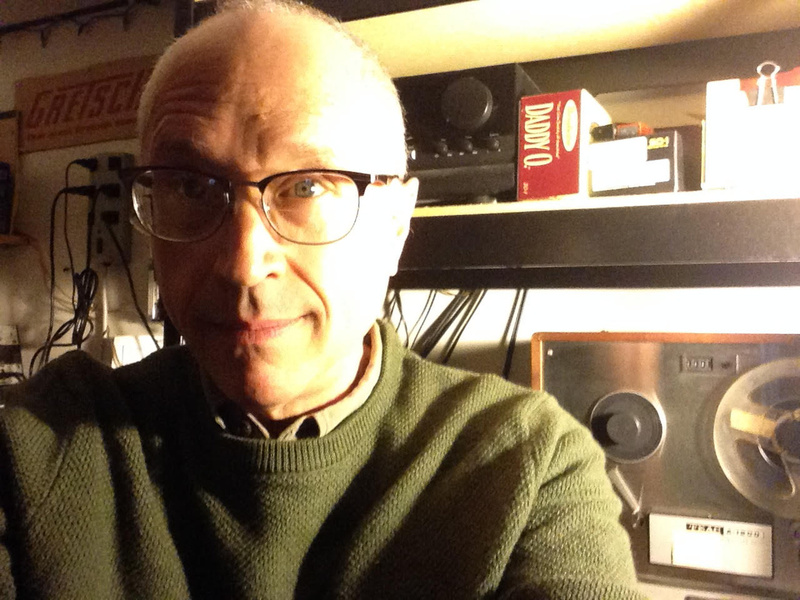 “Shortwave Radio” plays a similar role for me, albeit involving not duties as much as, simply, why I want to be in music, to the extent that I am. 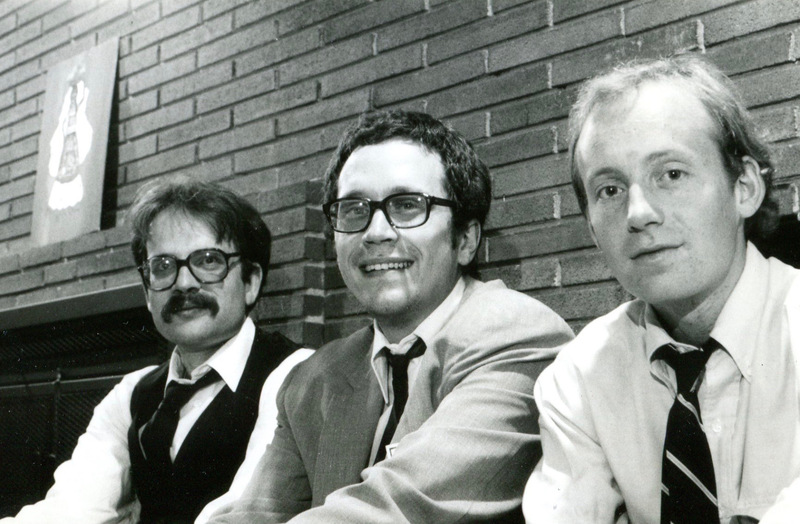 I started writing the lyrics in an art history class at USM in 1981, and finished the song up over a gin gimlet in my sister’s living room on a sunny summer evening, Bob Newhart on the TV, volume muted. This stayed in the repertoire for more than 20 years, from the Fashion Jungle to the Boarders to Howling Turbines. I can’t explain the doubled vocal in this late Boarders rehearsal recording. “Shortwave Radio” copyright © 1981 by Douglas L. Hubley. 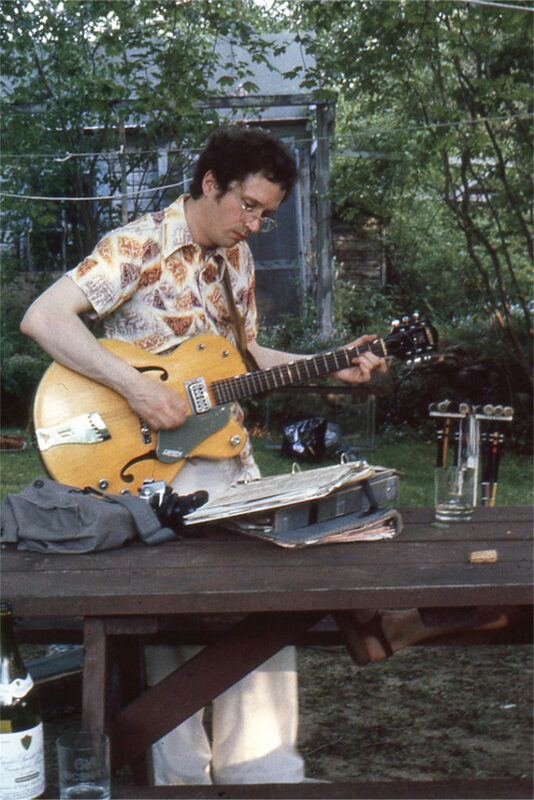 Slow Poison (Hubley) I wrote “Slow Poison” for the Cowlix in 1990, aiming for an Everly Brothers kind of thing that proved to be beyond my reach. But the song eventually made it into the ‘Lix setlist and thence to the Boarders’, whose energy suited it well. This song lives on in the Day for Night repertoire. “Slow Poison” copyright (C) 2010 by Douglas L. Hubley. 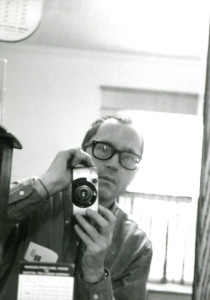 Watching You Go (Hubley) Fate is generous with opportunities to dwell on the loss of loved ones, but it took the death of my cat Harry to get me to actually write about it. Fortunately I was able to generalize the lyrics somewhat beyond “my kitty died.” A rehearsal recording from July 9, 1996, just prior to the Boarders’ last gig. “Watching You Go” copyright © 1996 by Douglas L. Hubley. Dance (Hubley) This song started out in 1988 as a Fashion Jungle collaboration on a setting for my bleak lyrics. Six or seven years later, casting about for material for the Boarders and feeling no more optimistic about the fate of the world, I rediscovered the lyrics and created a new tune for them. 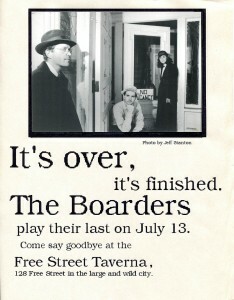 A rehearsal recording from July 9, 1996, just prior to the Boarders’ last gig. 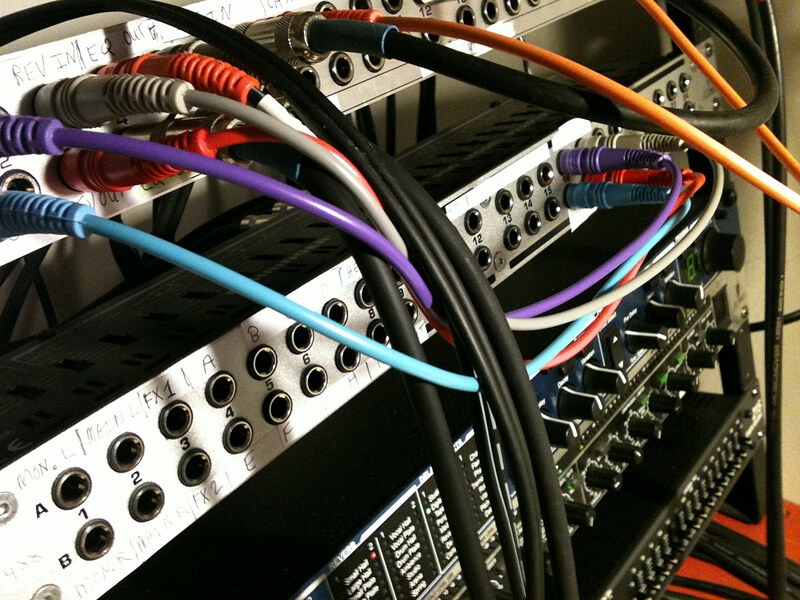 This recording is a copy of a copy made on a mastering deck with a wow-and-flutter problem, hence the wow-and-flutter. “Dance” copyright © 2010 by Douglas L. Hubley. Looks Like My Monkey Got Loose (Hubley) I must admit that Jonathan’s impression of a chimp being forced to put on a sweater had a certain inspirational effect here. (You diligent DePauw students who track this down on Google: Live it up!) But I was sitting on a Metro bus in January 1996, waiting to leave Elm Street, when I thought of a crazy monkey as a metaphor for lack of self-control. (You may not believe it, but I myself have had impulse-control issues.) I had most of the lyrics done by the time I got home. My only recording of the Boarders playing this selection, this is a copy of a copy made on a defective cassette deck. 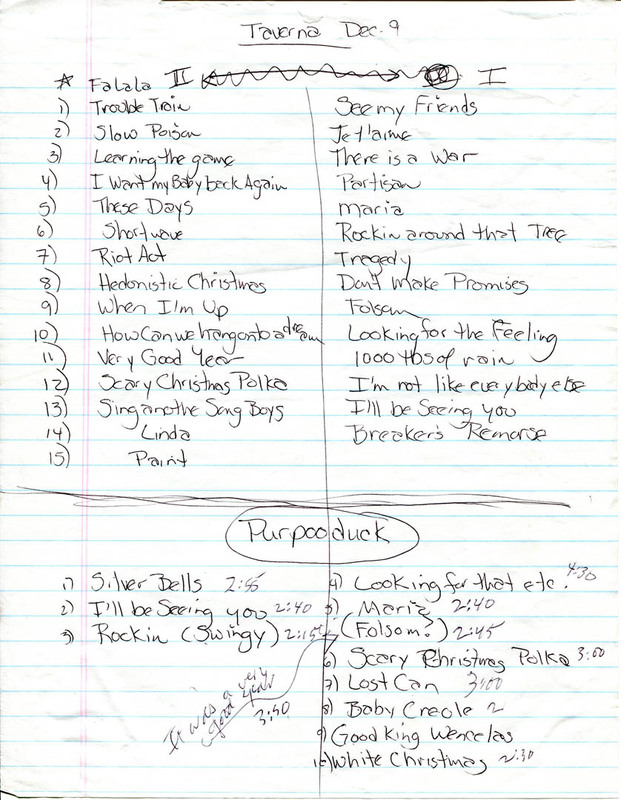 Recorded in June 1996. We had to give up the Little Debbie Swiss Rolls once and for all after the news about transfats came out. “Looks Like My Monkey Got Loose” copyright © 2010 by Douglas L. Hubley. Watching You Go (Hubley) A selection from The Boarders’ performance on “Local Motives,” a showcase for Greater Portland bands, on the University of Southern Maine radio station, WMPG-FM. Thanks to an incompetent mix engineer, this is one of only a few usable recordings from the session. “Watching You Go” copyright © 1996 by Douglas L. Hubley. 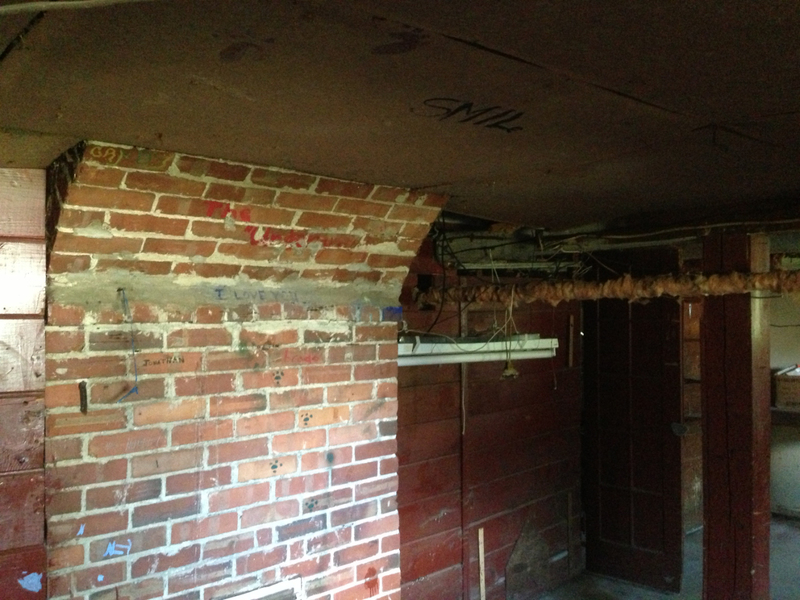 Notes From a Basement text copyright © 2012–14 by Douglas L. Hubley. All rights reserved. 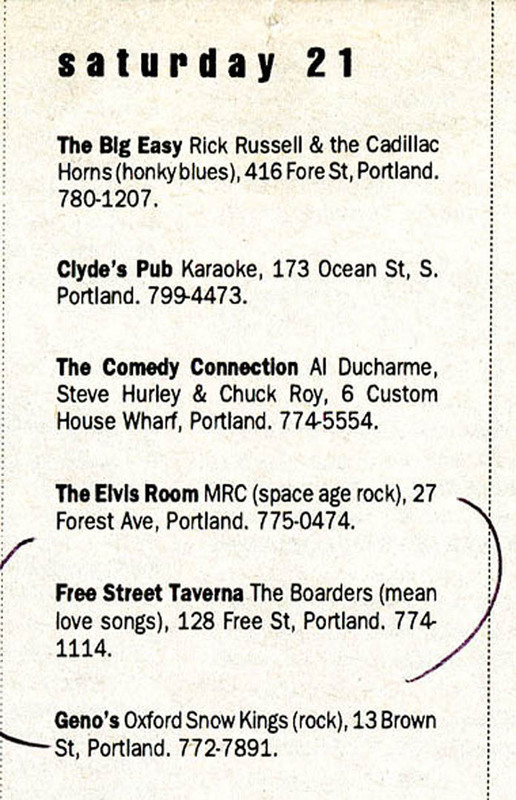 A Casco Bay Weekly listing for a Boarders gig at the Free Street Taverna, October 1995. Hoist these anchors of memory and sail away on the catchy riptide of the famous Boarders! gizmo on the bar and dollar bills stapled to the ceiling joists. At your back was the window, a big one, and beyond that the sidewalk. To your left, a vestibule enclosed the street door and stairs up to the restaurant. The vestibule was close enough to the stage that anyone who entered or left had to crowd past a PA speaker, and sent cold drafts across the stage in winter. 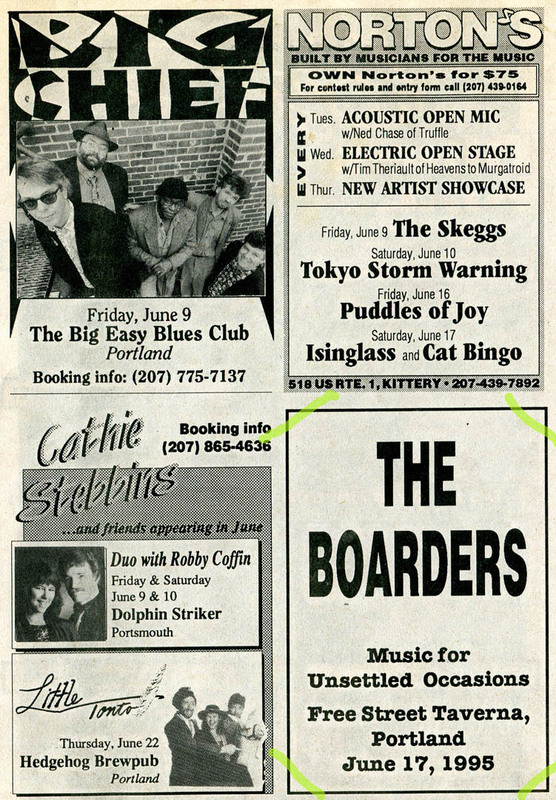 The Boarders in a 1994 publicity image by Jeff Stanton. 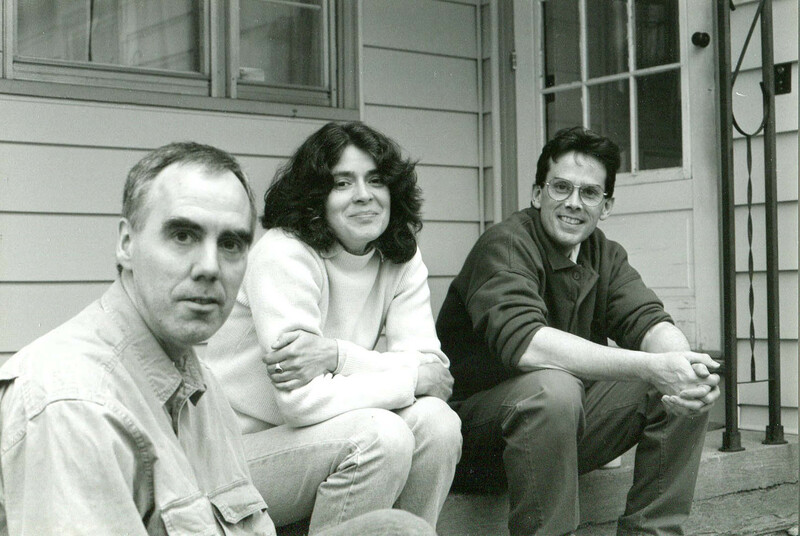 From left: Gretchen Schaefer, Jonathan Nichols-Pethick, Doug Hubley. Hubley Archives. Bassist Gretchen Schaefer occupied the left side of the stage. Drummer Jonathan Nichols-Pethick set up in the center. I was at stage right. 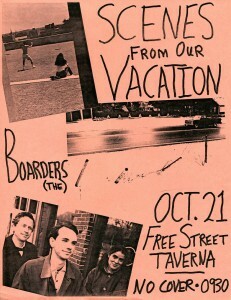 This was the mid-1990s in Portland, Maine, and we were the Boarders. The space was intimate. 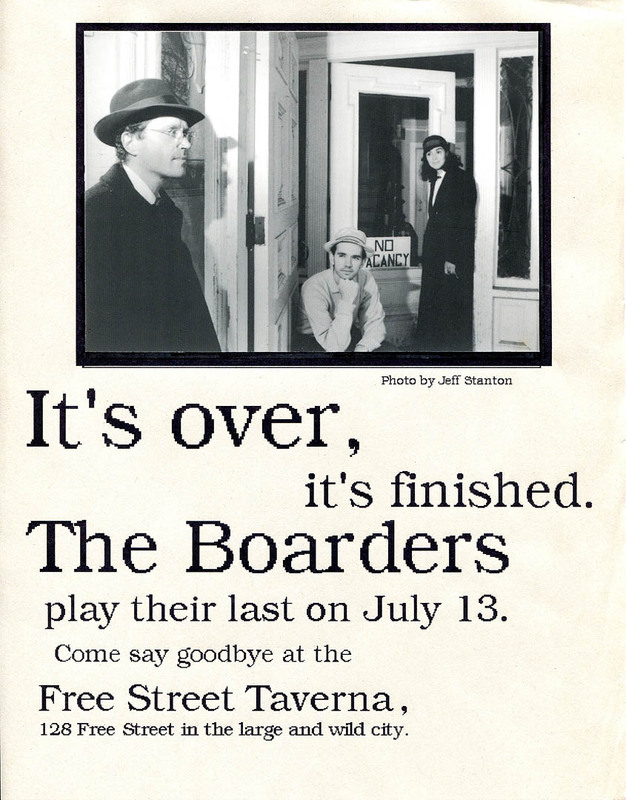 I remember the faces of friends who frequently came to hear the Boarders at the Taverna: Jeff Stanton and Alden Bodwell, who helped with load-in and setup; Barbie Weed and Tracey Mousseau; former bandmates Ken Reynolds and Steve Chapman, and Steve’s wife, Jeri Chapman. Three musicians and a marketing concept. Jeff Stanton photo. Sometimes the nights were long and I could see our friends propping themselves up above the rising waters of fatigue. We were into our 40s. But virtually every other Boarders gig took place at the Taverna, located at 128 Free St.
Our poster for that October 1995 Taverna date. The second image from the top shows the fence at Gretchen’s and my house after a motorist flattened it. I propped it back up and the insurance money paid for a trip to Montreal (top). Hubley Archives. A restaurant as well as bar, the Taverna was a happening place in those early days of the “Portland Arts District” — a concept that I mocked at the time but that now seems to have taken hold. Taverna proprietor Peter Kostopoulos had the Arts District spirit. 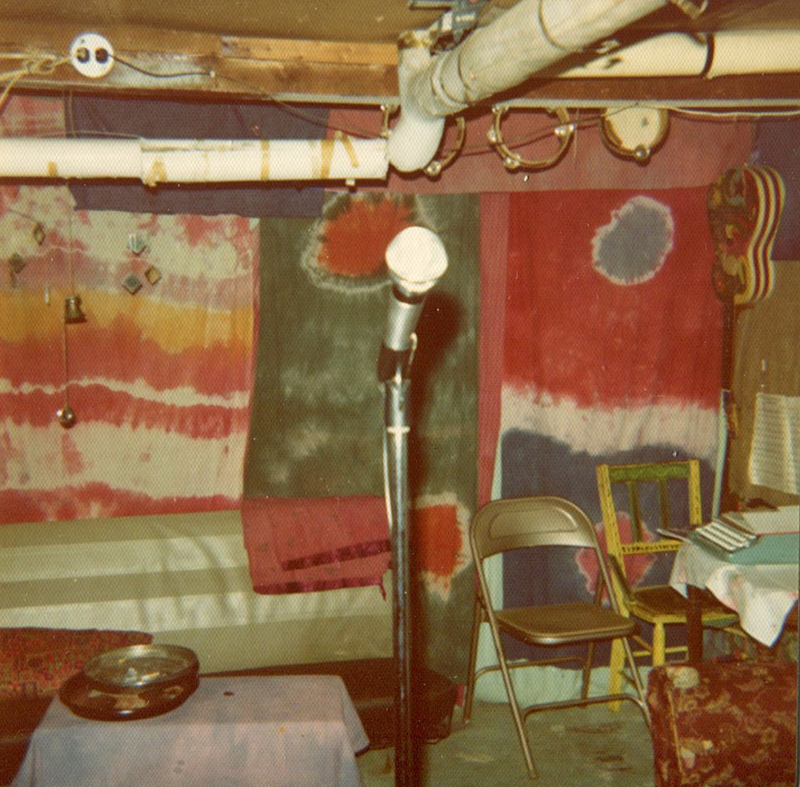 He booked adventurous bands, hung local artwork on the brick walls and presented bohemian activities like poetry nights. (We still recall an earnest young blonde from Texas who read poems about wolves and about being naked, pronounced “woofs” and “nekkid.”) It was a scene, man! 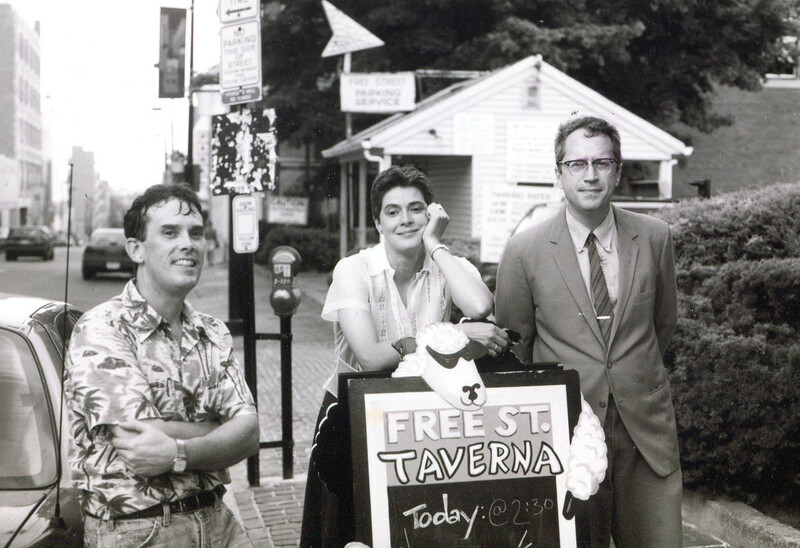 The Kostopoulos family had once run the Zapion Taverna, a Greek restaurant on Congress Street, and still run the Good Table in Cape Elizabeth. There were Greek dishes on the Free Street Taverna menu. The Taverna building belonged to the family. From 1968 until 1974, Peter’s parents, Tony and Sylvia, had International Cargo there, a sort of proto-Pier 1. 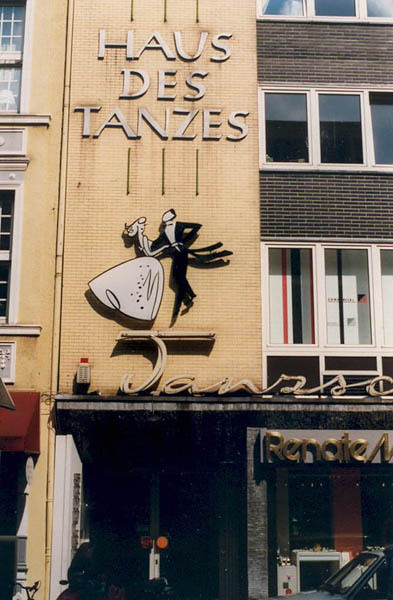 It was previously the site of a tailor shop owned by Sylvia’s father. In those days, Victor Kahill, who sculpted the Maine Lobsterman statue, had his studio upstairs. The clock from the tailor shop now hangs at the Good Table. A Gretchen Schaefer illustration for the Maine Times A&E section. The Mayans appeared frequently. Hubley Archives. Peter was a good boss. We got a cut of the bar, which never made us rich because we weren’t a huge draw, but at least it acknowledged the notion, which now seems rather quaint, that musicians should be paid for their work. And Peter kept bringing us back every three or four months despite the smallness of our following. What a time that was. Against all evidence, I remain convinced of my coolness and cutting-edginess, but I really had it bad back then. 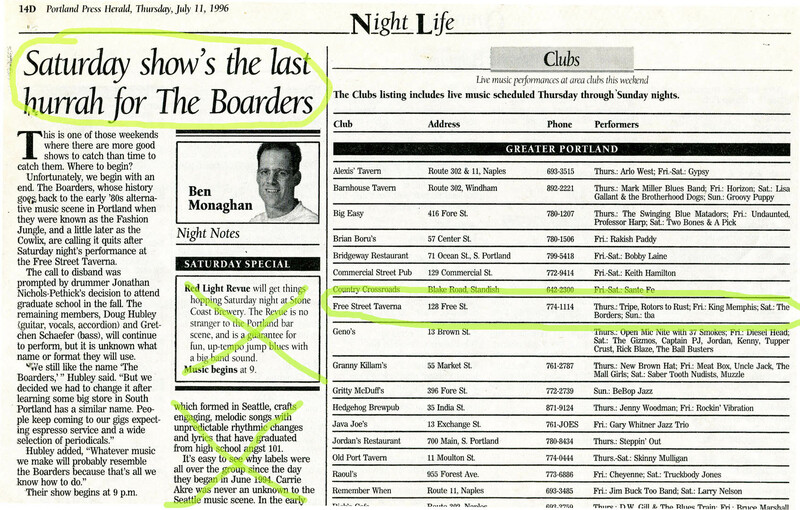 During the Boarders’ first year, I was features editor at Maine Times — running out of steam by the time I got there, but still wielding its prestige, and frequently its value, as Maine’s first and foremost alternative newsweekly. A display ad in Face magazine for a June 1995 date at the Taverna. Hubley Archives. The Boarders were demonstrably cool. Solid original material, well-chosen covers, attractive mix of musical styles, cathartic and funny performances. It was one of those rare periods in life when our endeavors and the circumstances sang in harmony: a band in its sweet spot, a certified hip-and-cool nightspot willing to book us, a burgeoning local arts and music scene. The logical question at this point is, of course, what could possibly go wrong? Surprisingly, at least as far as the Boarders were concerned, not much did. I only have one regret on that score: that I never recorded our live shows. That lapse resulted from my proclivity to hole up mentally. Despite my reflexive self-image of being a bold thinker, in the real world I realize that I don’t tend to think outside the box. Moreover, I don’t push the envelope because how would that work, anyway? And I don’t leave my comfort zone because — guess what? — it makes me uncomfortable. I tend to perceive obstacles more than opportunities. I see myself being boxed in by circumstances and restrained from acting, but the truth is that my thinking gets boxed in by habit, laziness, fear, or lack of curiosity or imagination. Boarders bassist Gretchen Schaefer. Jeff Stanton photo. So what does this unfortunate mindset have to do with performance recordings, which I had made routinely for years prior to the Boarders? In late 1994, I began recording band rehearsals on a four-track machine in place of a two-track. 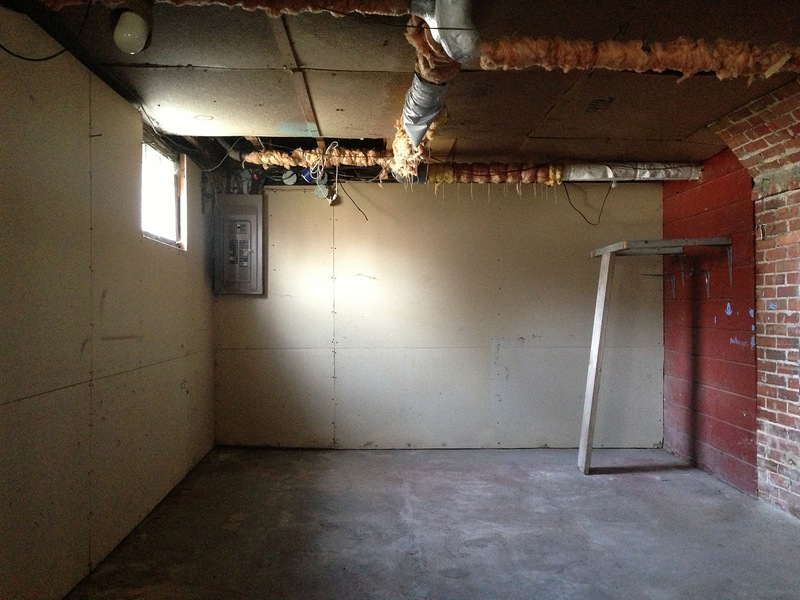 That was fairly complicated (probably twice as complicated as the two-track) but manageable in a basement. However, I believed it would not be so manageable in the performance environment. It never occurred to me that I could bring the four-track to a gig but use only two tracks, as I had done for years when I had only two-track machines to work with. This bright idea, by the way, has occurred to me only now, 20 years too late. In short, there were expeditious ways to get the job done. I just couldn’t see them. 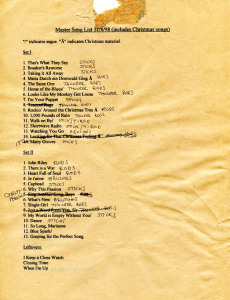 Setlists in Gretchen’s handwriting for holiday gigs at the Taverna and a Rotary Club seniors event at the Purpoodock Club. Hubley Archives. So what was lost? 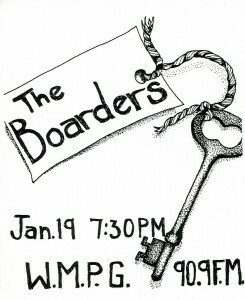 Every Boarders performance save for our January, 1996, live show on Portland radio station WMPG-FM, which the station recorded (badly, omitting the bass almost completely). What was lost? It’s not like our music is irretrievably vanished. I have plenty of rehearsal recordings by the band. 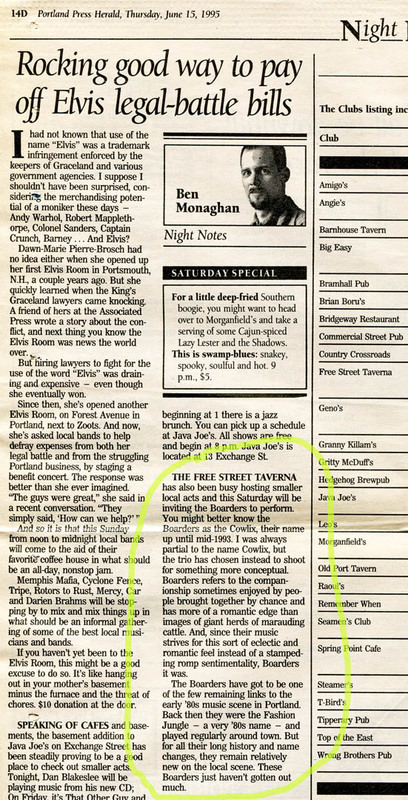 But I would love to hear the actual performances on those Taverna nights. The music with its highs and lows, the way the songs coalesced (or didn’t) into sets, the random details: song intros, jokes on stage and remarks to our friends in the audience, greetings to new arrivals, the guitars being tuned and racket from the bar. More than anything, it’s those details that create the illusion that the moment lives again, poised to be relived by the people who were there all those years ago. Of course, the grand subtext of these memoirs is the relationship among experience, memory and document. As I stated in a 2012 post, for me the documents promise to be a supplement and stimulant to memory — but the promise is sometimes broken, as the documents mislead, confuse or simply don’t exist for the memories I hope to recover. I spent much of that November 2012 post exploring the relationship among experiences, memories and physical proxies thereof. I asked a lot of good questions and produced few good answers. In the year and a half since then, having cleaned out my parents’ house and seen how masses of stuff definitely do not translate into a lifetime of memories, I am more in the dark about this issue than ever. Maybe an experience is like the big love of your life: You don’t perceive half of what’s happening around you, but the impression feels complete, a world unto itself. And then a memory is like that relationship when your lover is gone. And then a document is just the rebound affair, something to see and touch while you try to get back to the real thing, which of course you’ll never do. 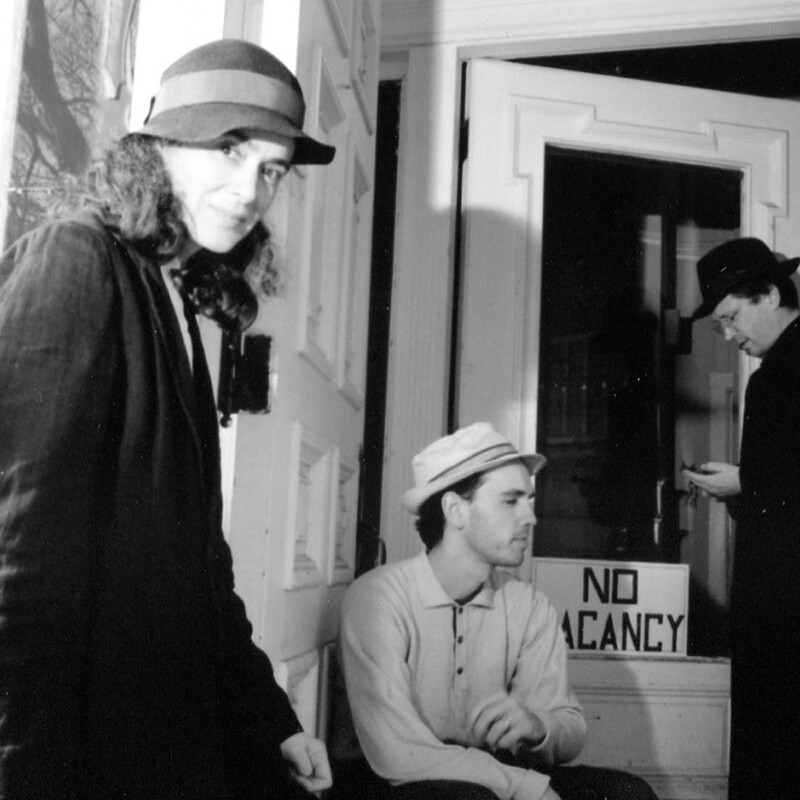 Hear a collection of Boarders rehearsal recordings from 1994-95. Tragedy (J. Nichols-Pethick–N. 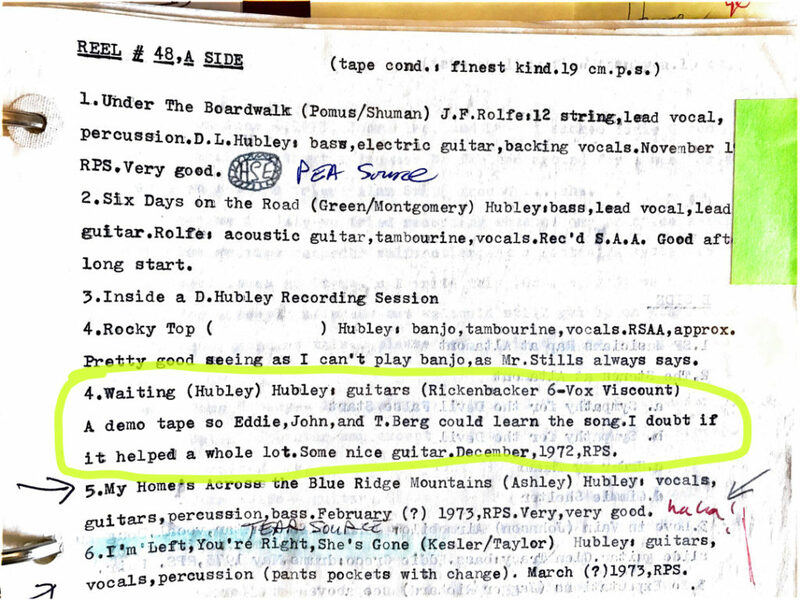 Nichols-Pethick–Hubley) Drummer Jon Nichols-Pethick had previously contributed “All Over” to the Cowlix. His ironic awareness of the details of romantic tension suited the repertoires of that band and even more, the Boarders. He wrote this song with his wife, Nancy, and I added the signature riff and a few lyrics. 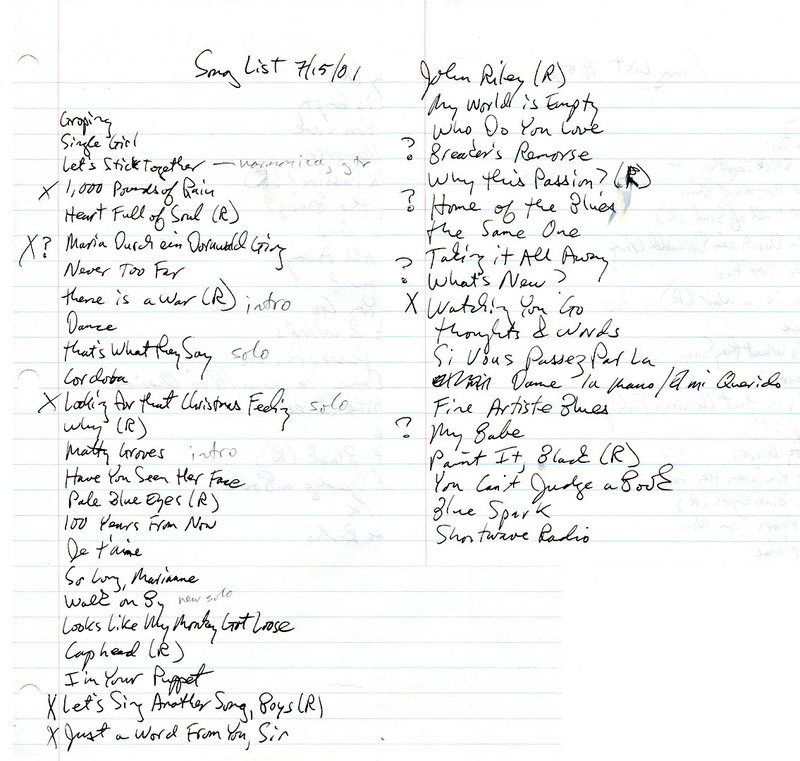 (But dropped a few lyrics in this rehearsal performance from Dec. 5, 1995: “You say, ‘I need another drink. '”) Note the tribute to “Hill Street Blues” at the end. “Tragedy” copyright © 1995 by Jonathan Nichols-Pethick, Nancy Nichols-Pethick and Douglas L. Hubley. All rights reserved. Trouble Train (Hubley) There was a sign by the Androscoggin River in Topsham, Maine, warning that operations at the nearby hydroelectric dam could cause the water to rise suddenly. That sign inspired this song, which is less a train song than a collection of metaphors for trouble. This was one of two songs I wrote for the Cowlix; the Boarders’ more ominous treatment befits the theme. “Trouble Train” copyright © 1994 by Douglas L. Hubley. All rights reserved. All Over (Nichols-Pethick–Hubley) Written by Jon Nichols-Pethick with some tweaks from me, this is a classic country weeper with a great beat. Jonathan actually was inspired to write the song as he gazed at the bottom of a beer glass. Originating with the Cowlix, it later turned up in the repertoire of Scott Link’s band Diesel Doug & the Long-Haul Truckers, appearing on their first CD in a contrasting interpretation. 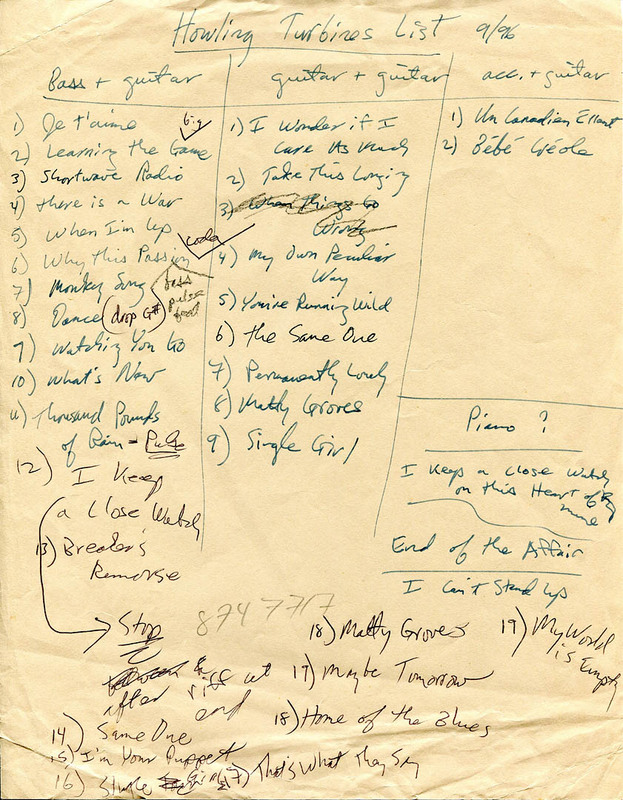 A rehearsal recording from Oct. 15, 1995. “All Over” copyright © 1992 by Jonathan Nichols-Pethick and Douglas L. Hubley. All rights reserved. Why This Passion (Hubley) A wordy attempt to trace the course of a lovers’ quarrel, this high-romantic epic started out with the Chapman-Torraca Fashion Jungle in an arrangement much too elaborate. Once we reformed the FJ with bassist Dan Knight, I reset “Passion” to a straight beat with the guitar riff heard here. But this version is a further evolution, developed with the Boarders under the influence of Three Mustaphas Three. Drummer Jon Nichols-Pethick plays what we called the “camel beat” and my guitar solo pays homage to Middle Eastern pop radio (as I imagined it). An over-processed rehearsal recording from April 1996. 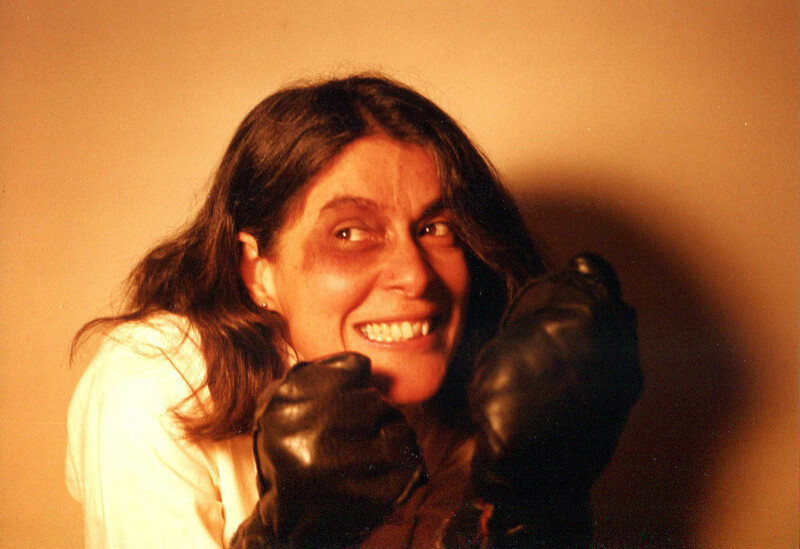 “Why This Passion” copyright © 2010 by Douglas L. Hubley. All rights reserved. 1,000 Pounds of Rain (Hubley) The Boarders in a December 1995 rehearsal recording of a desperate cry of the middle-aged heart, written in spring 1994. Notice the gains in ensemble and intensity over the 1994 version on The Boarders, All Keyed Up. 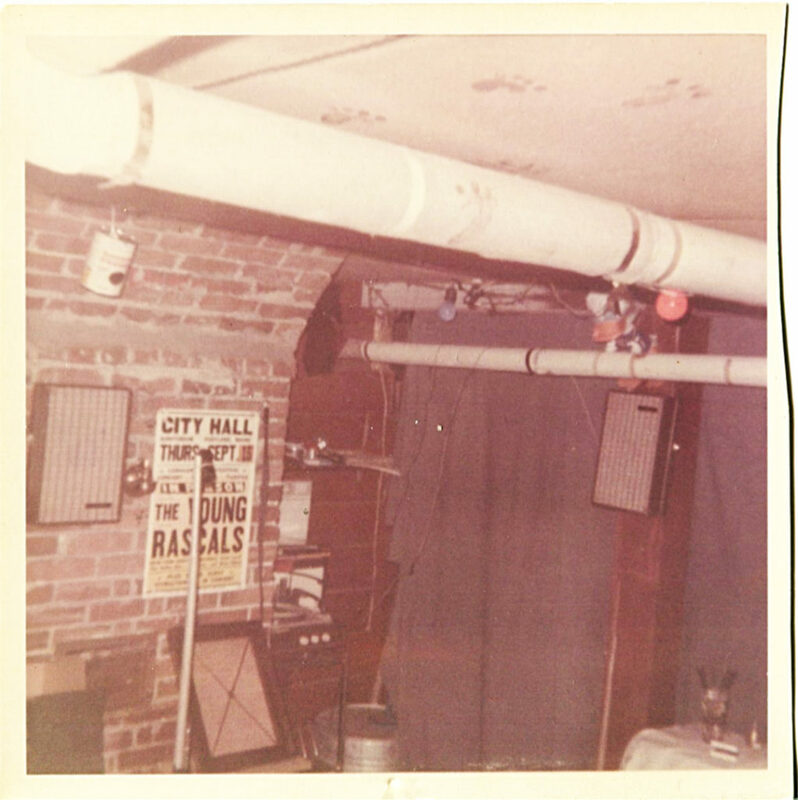 The title came from a Drydock gig for which we were made to carry our equipment up a fire escape in the pouring rain. I liked the title, but it took me four years to figure out what the song should be about. One of the first songs the Boarders learned, it stayed on the playlist all the way through the Howling Turbines. “1,000 Pounds of Rain” copyright © 1995 by Douglas L. Hubley. All rights reserved. Notes From a Basement text copyright © 2012-14 by Douglas L. Hubley. All rights reserved.